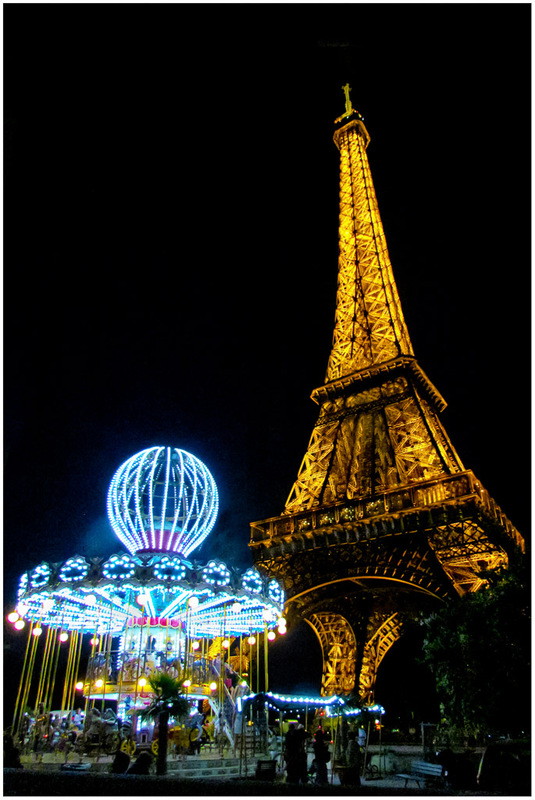 At night the Eiffel vicinity takes on the air of a busy amusement park. He's captivated by the view of the tower as he waits for the after sundown light show. 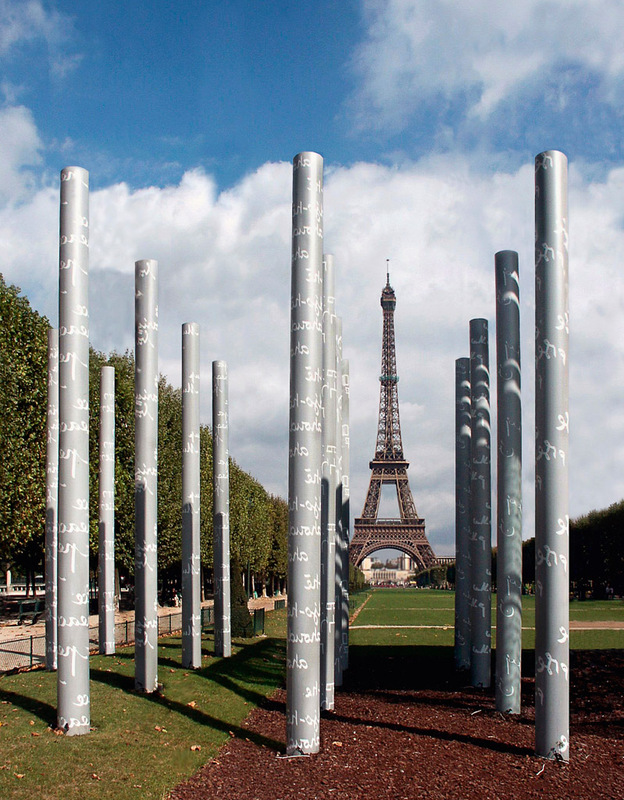 The pillars in the Parc Champ-de-Mars spell out peace in 32 languages. 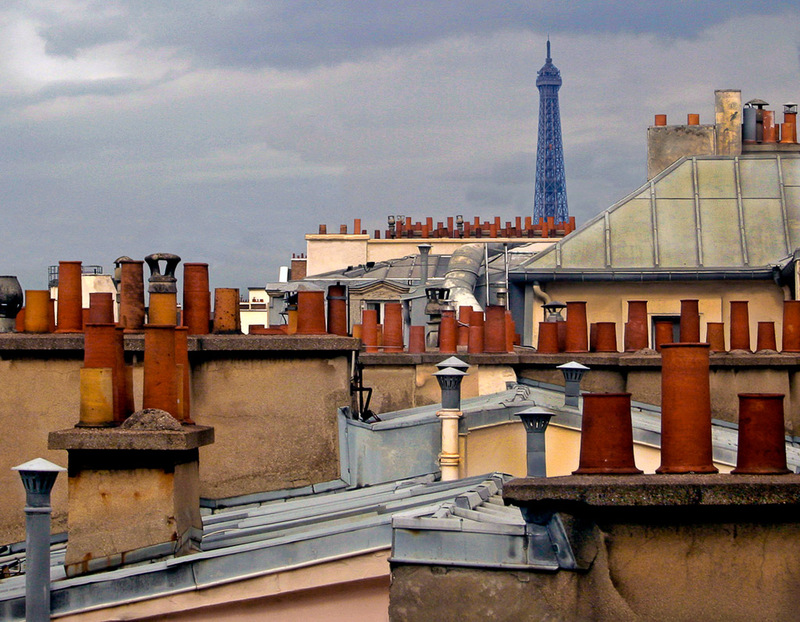 Tour Eiffel seen from a 6th floor apartment in the 7th arrondissemont. 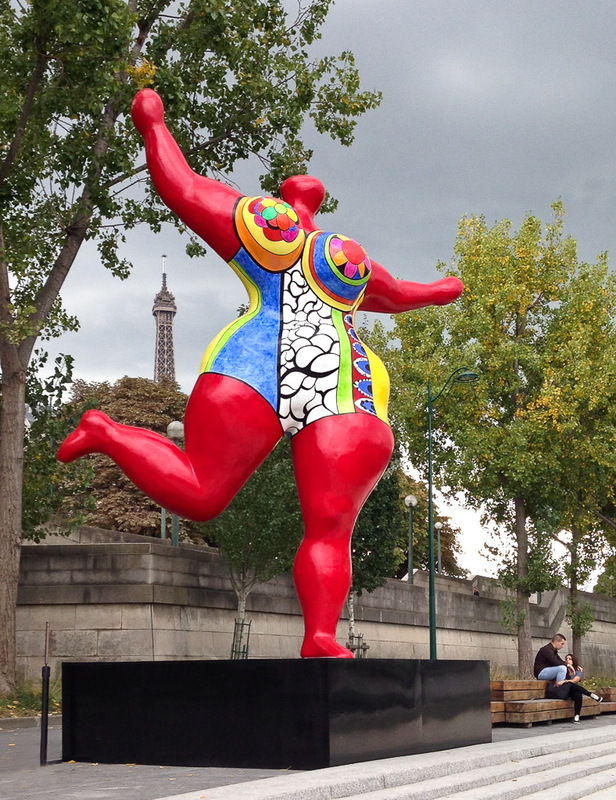 A 2014 installation on the Seine is one of Niki De St. Phalle's Nana's. 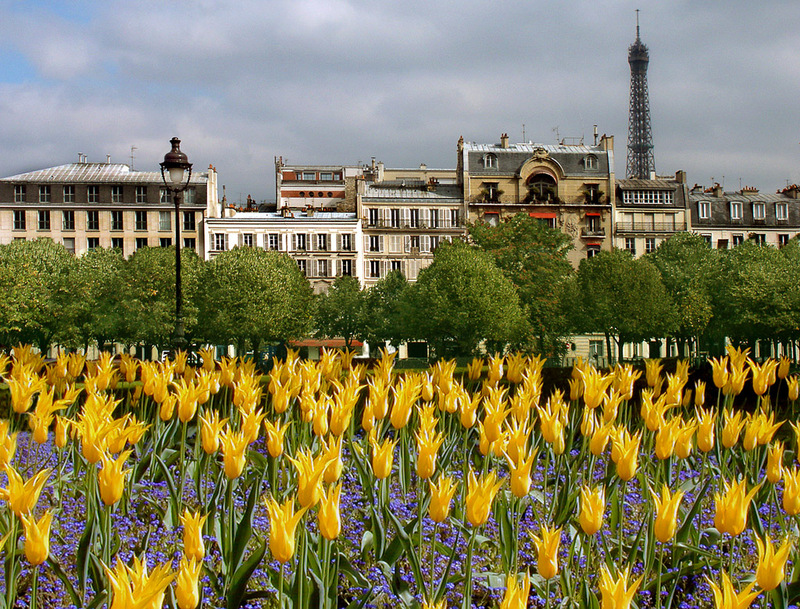 In April the tulips as well as the chestnuts are in full blossom. View from the 6th floor of an apartment in the 7th arrondisement. Looking up the the Champs-Élysées to the arch. 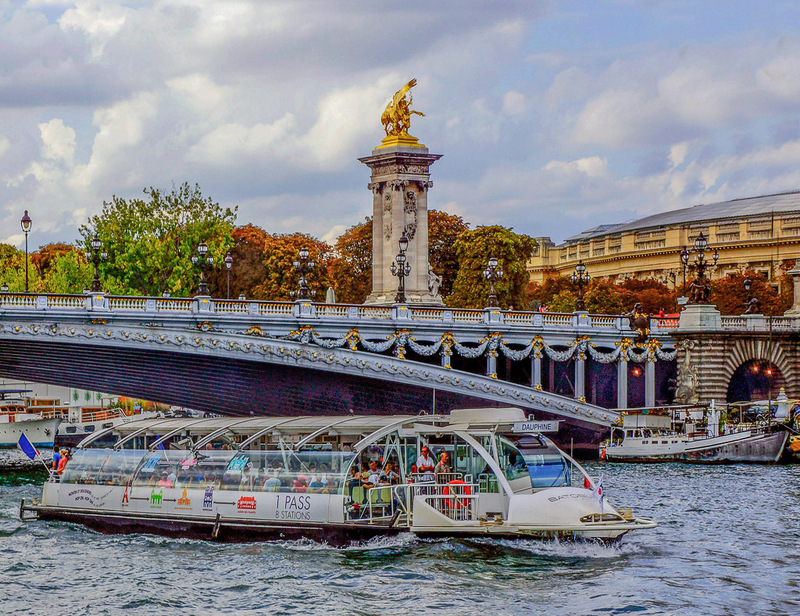 Just one of the many boats that you see any given day on the Seine. 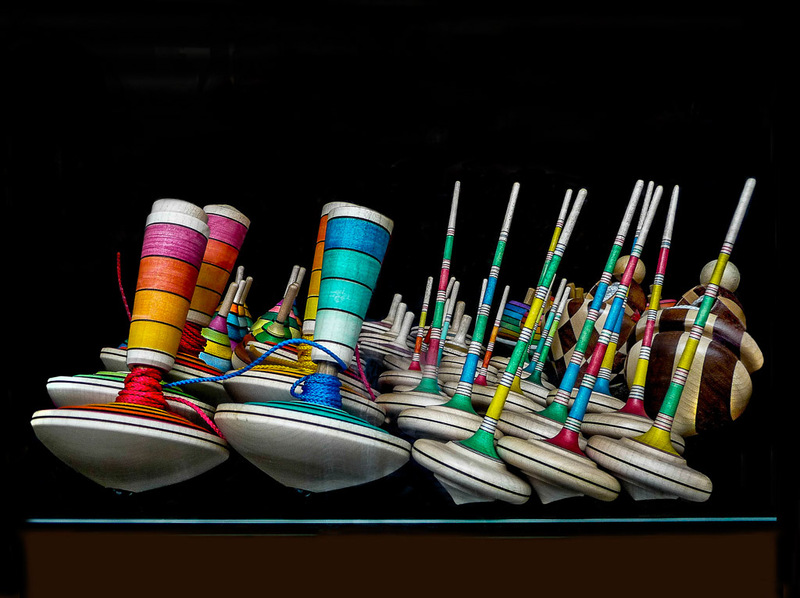 A colorful display seen through a Paris shop window. 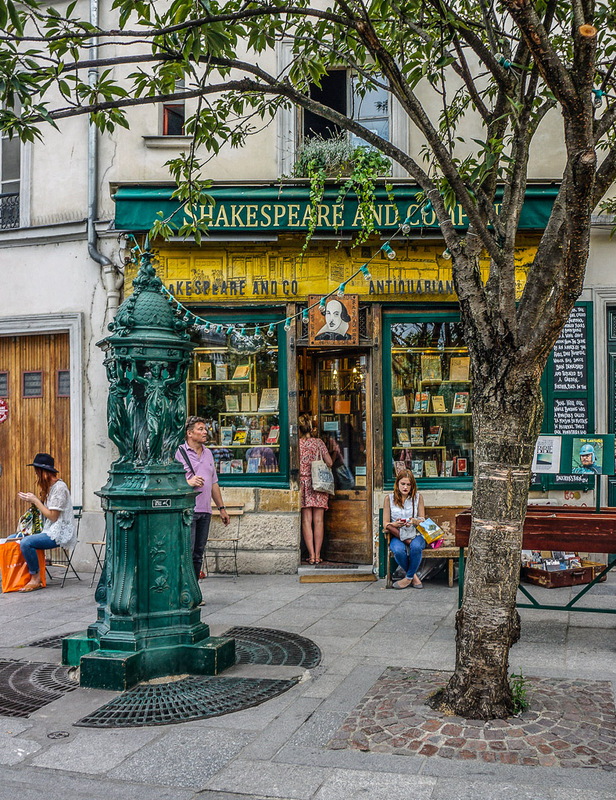 The famous English language bookstore by the Seine near Notre Dame. 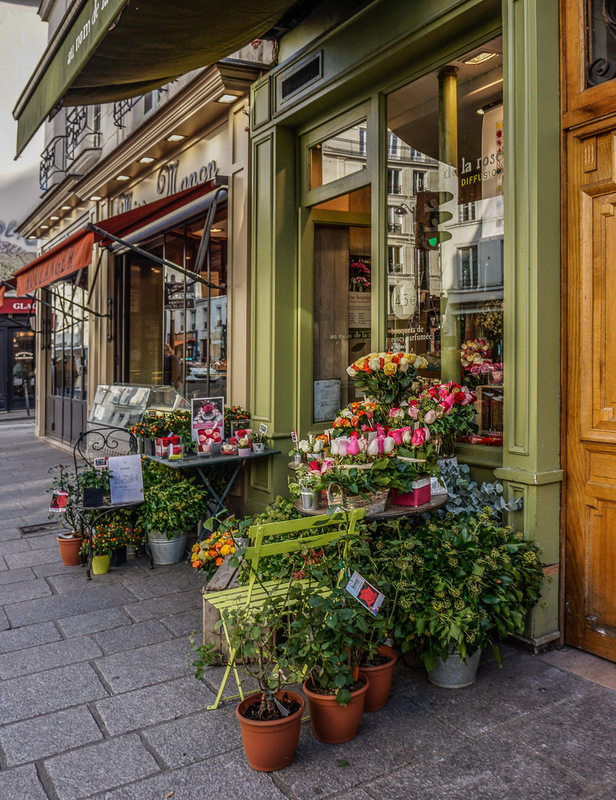 One of the many colorful flower shops found in Paris. 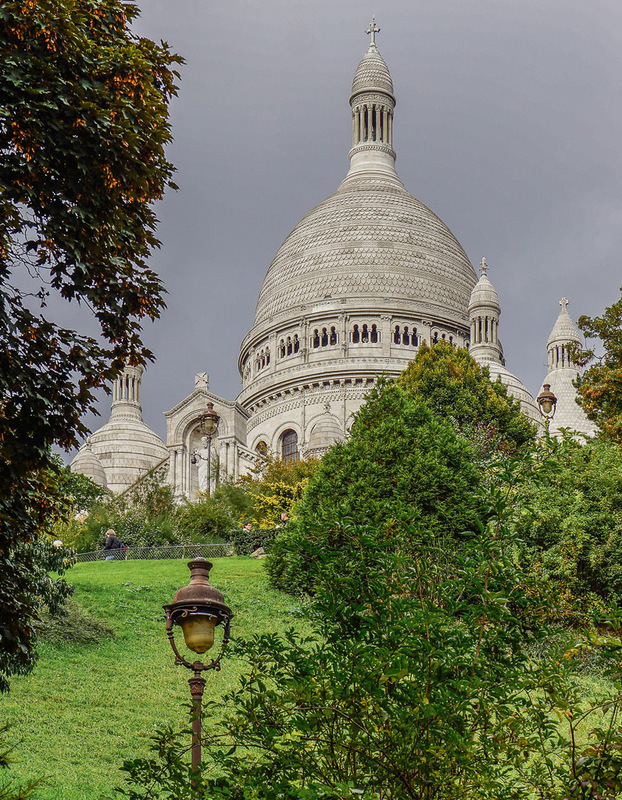 The Montmartre resting place of the famous Italian singer and actress. 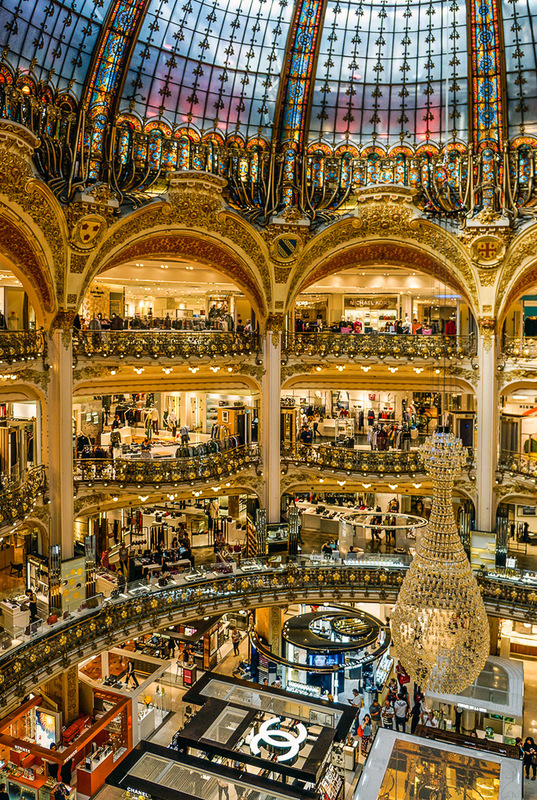 One of the most famous department stores in the world. Another one of Lafayette's eye catching displays in the lingerie department. 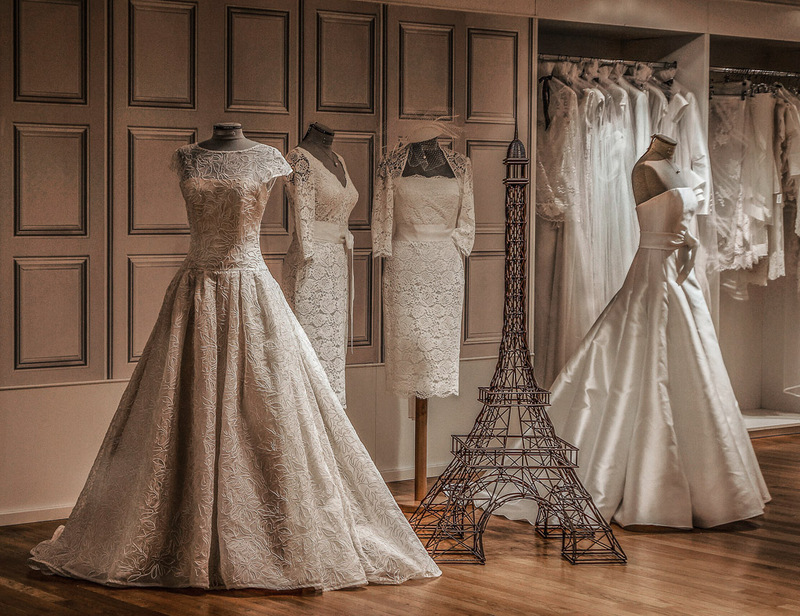 Some wedding dress choices for the French bride offered at Lafayette. 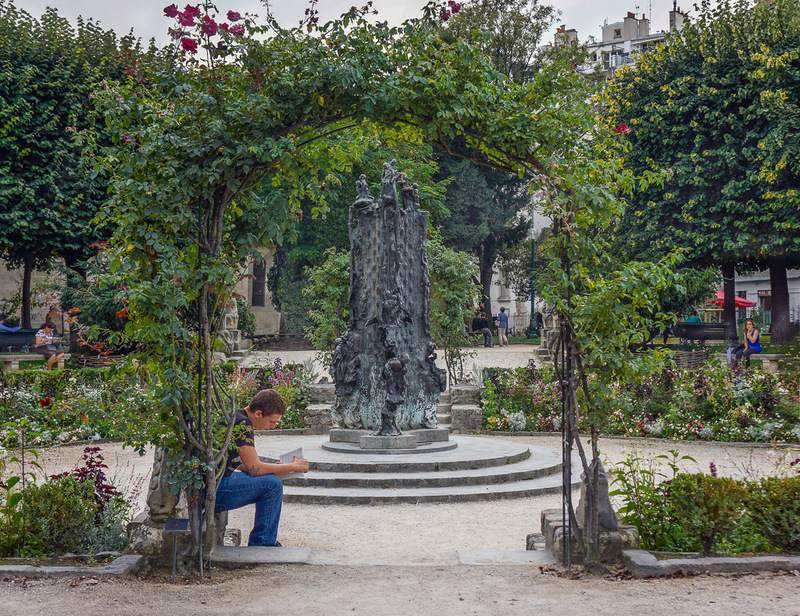 Paris parks are a peaceful place to catch up on your reading. 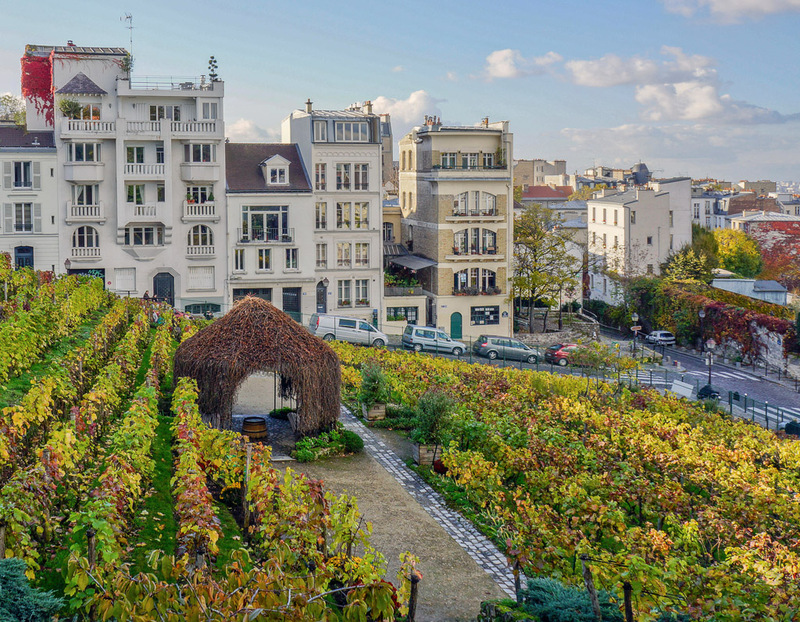 A working vineyard and winery on a Montmartre hillside. 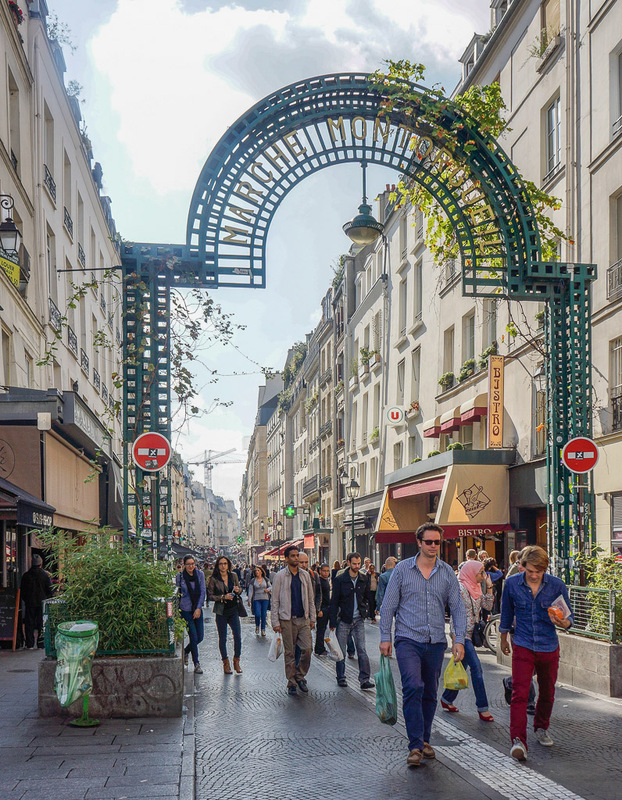 A great place in the Marais for shopping, dining, art and to live. 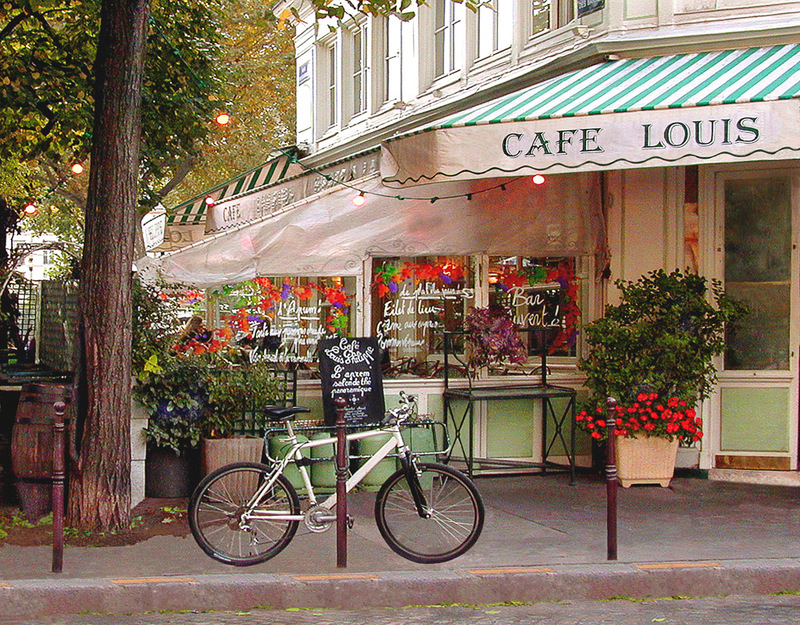 One of the left bank's many colorful side walk cafés. A different view looking up from the side street just below. 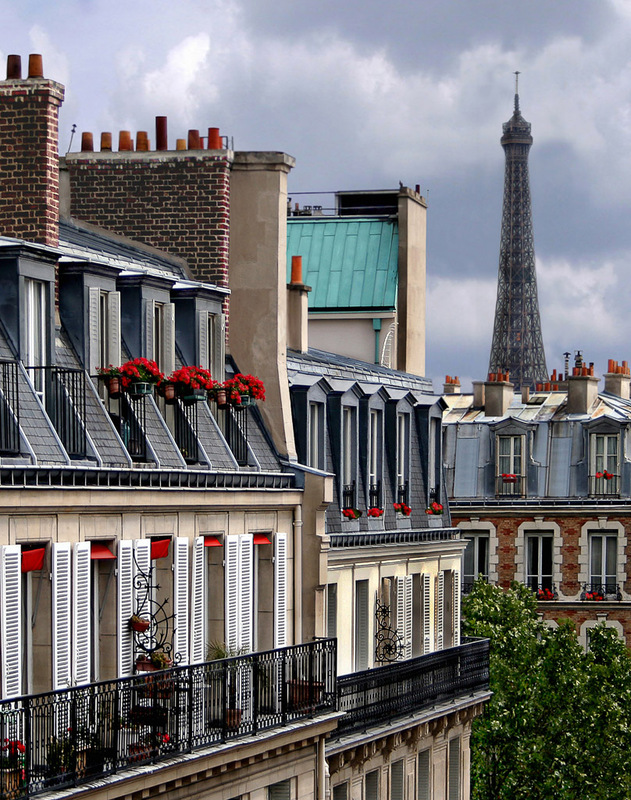 An Eiffel view looking down the street where Edith Piaf was born (some say under a street lamp). 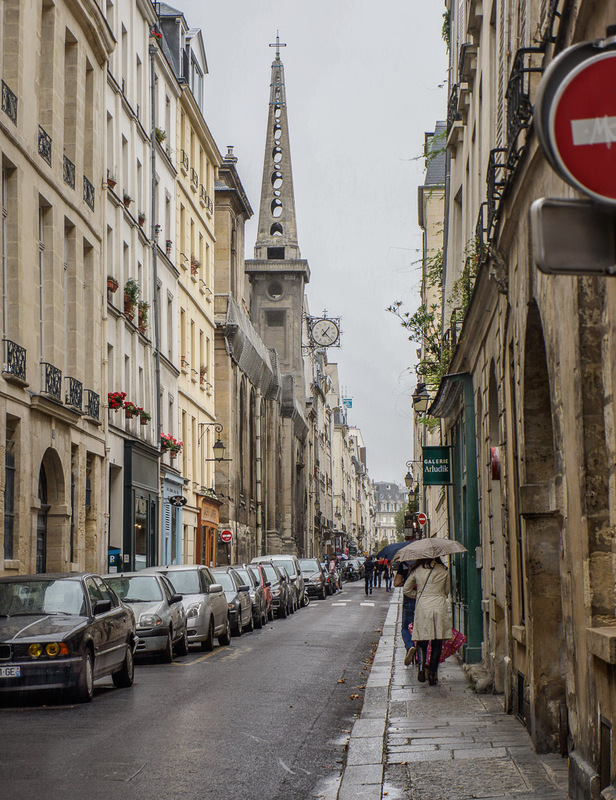 One of our favorite streets on the Ile St. Louis. 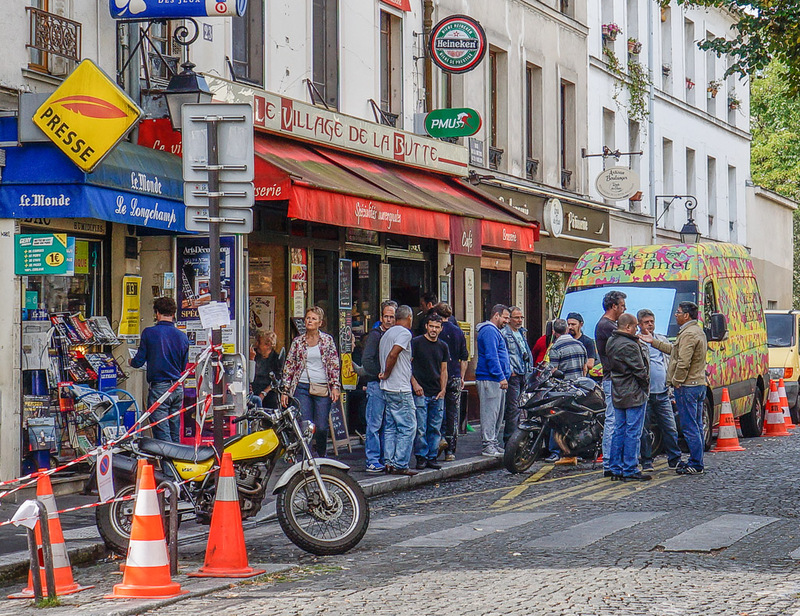 One of many pedestrian streets in Paris where you find a lot to tempt the taste buds. The locks began to collapse bridge railings so many are being removed. 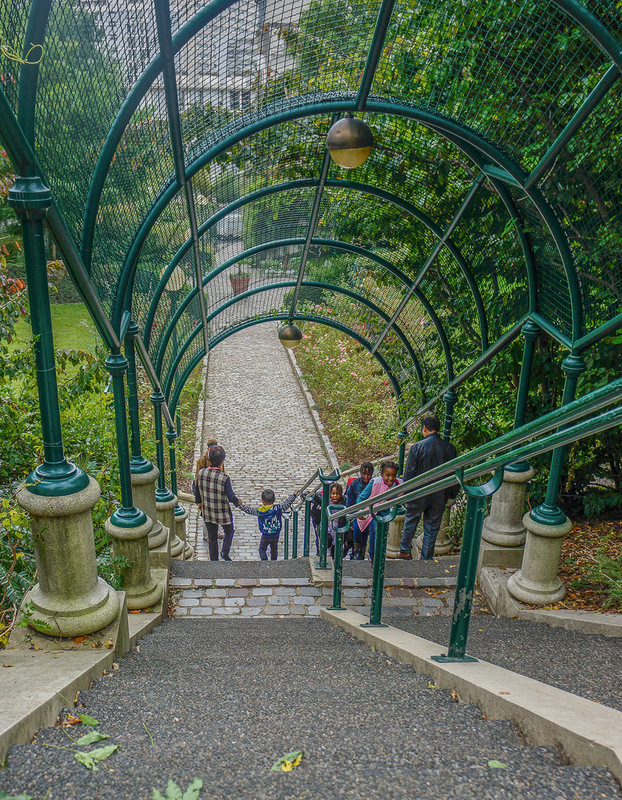 Whether going up or down, using the steps to the park takes your breath away. 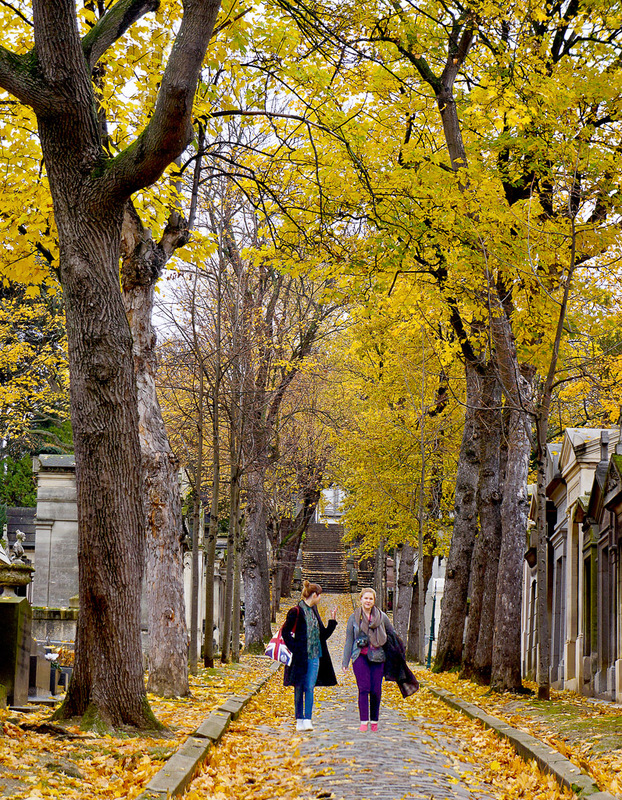 For Americans, Cimetaire Père Lachaise is best known for being where Jim Morrison is buried. 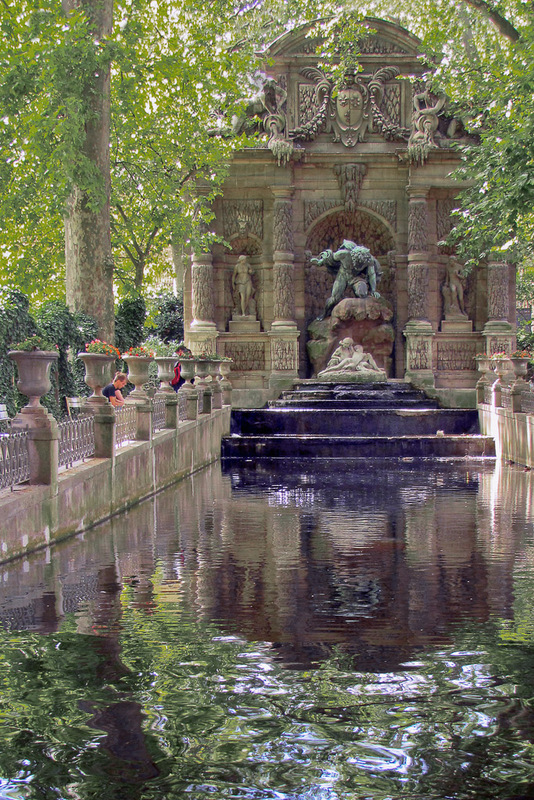 The breathtaking fountain is found in the Luxembourg Gardens. 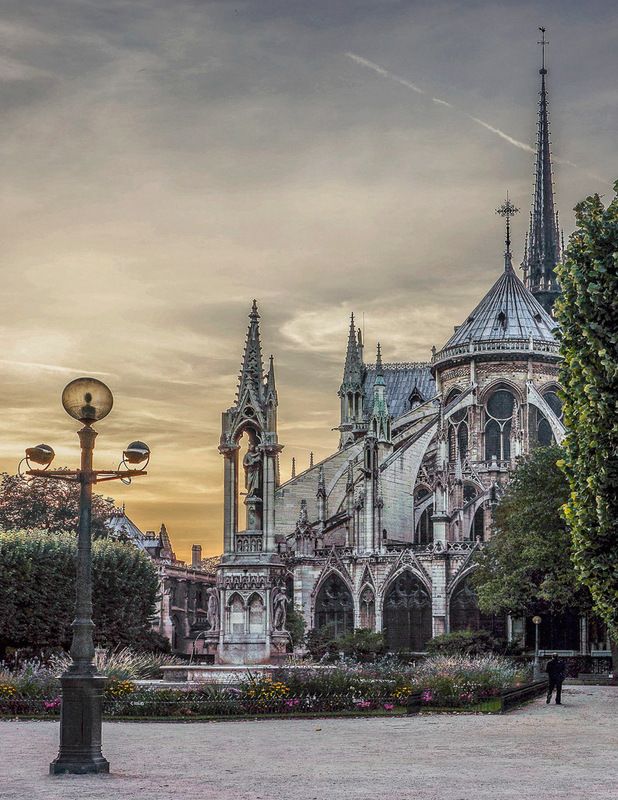 For me, Notre Dame is most beautiful just before the sun goes down. The trendy young Parisians strike a pose at Musee` Rodin. 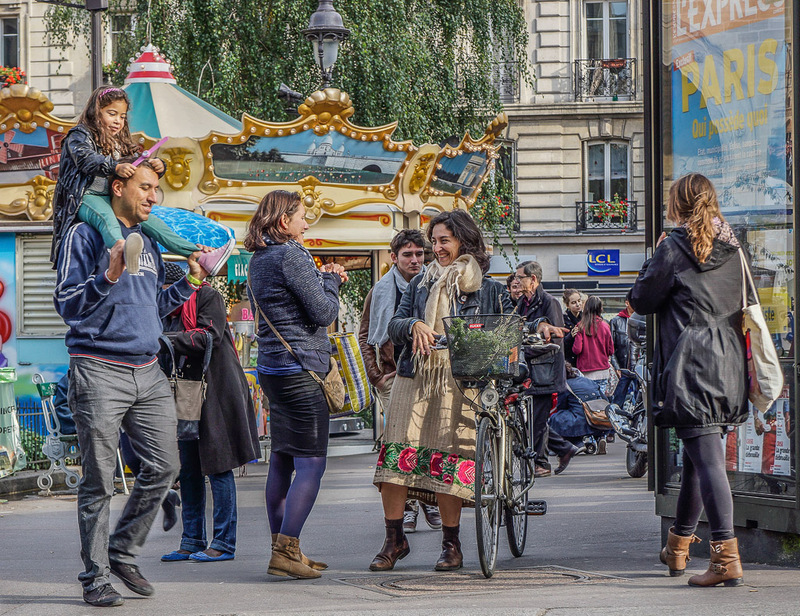 Roller blading has become a favorite pastime as well as a mode of transportation in Paris. 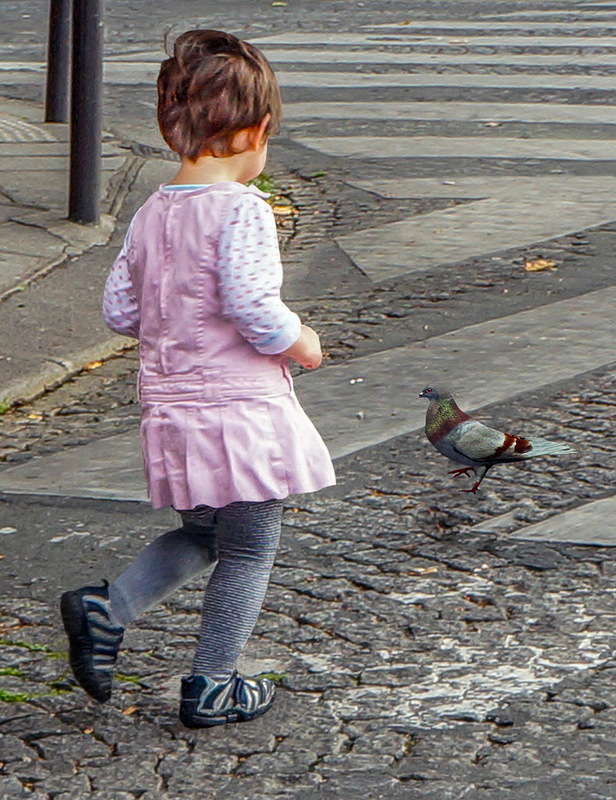 There are plenty of pidgeons for little girls to chase in Paris. 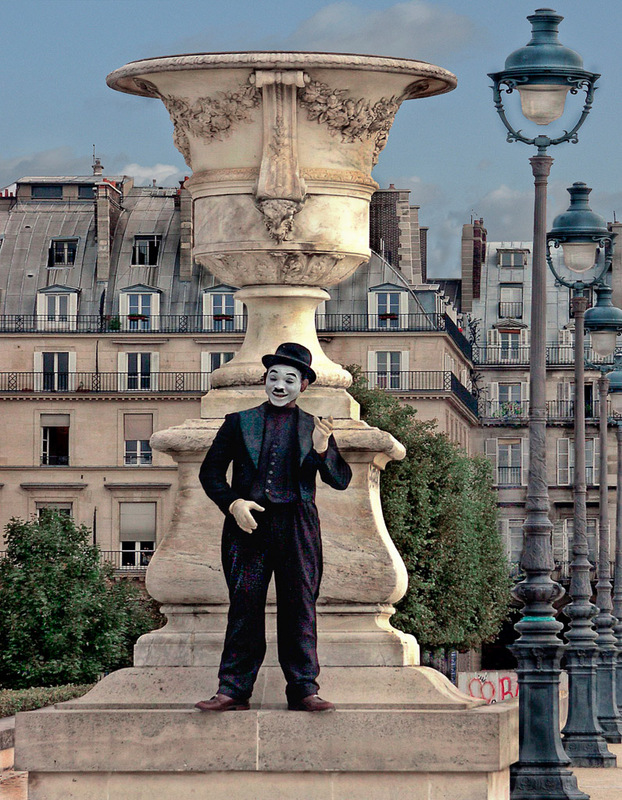 One of the many mimes who perform at the places tourists most often frequent. 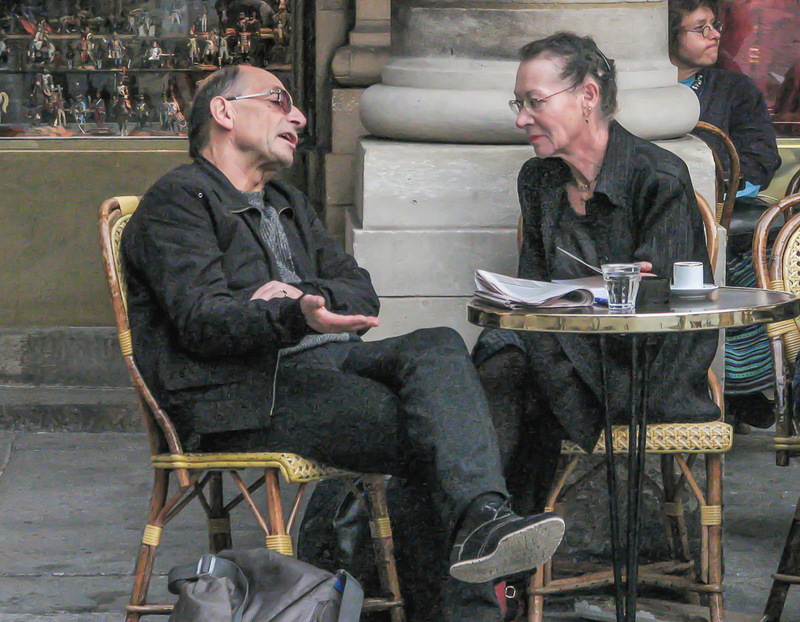 A familiar scene at the Royal Turenne cafe in the Marais. 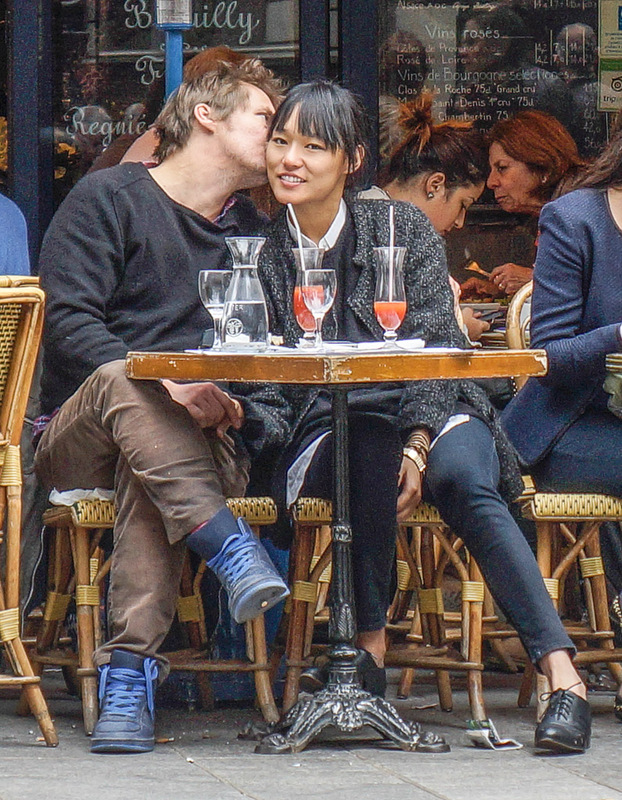 They enjoy an after school laugh between kisses in Les Halles. 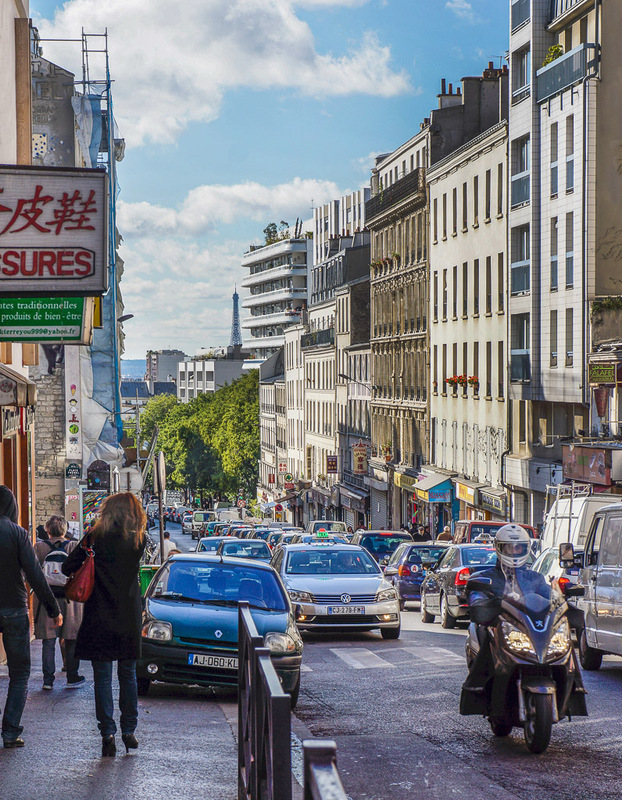 Paris continues to deserve it's world wide reputation as the Cité' d'Amour. 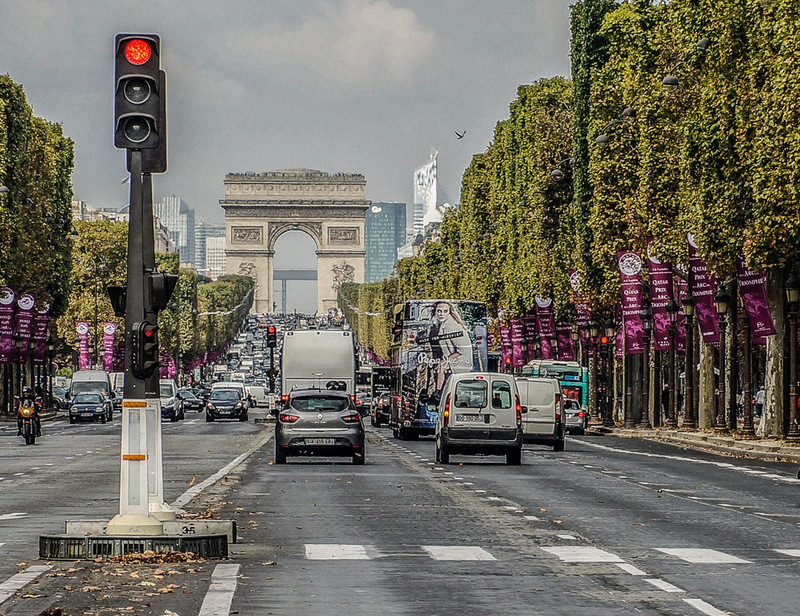 This deception to the eye is on Avenue Rapp near Tour Eiffel. 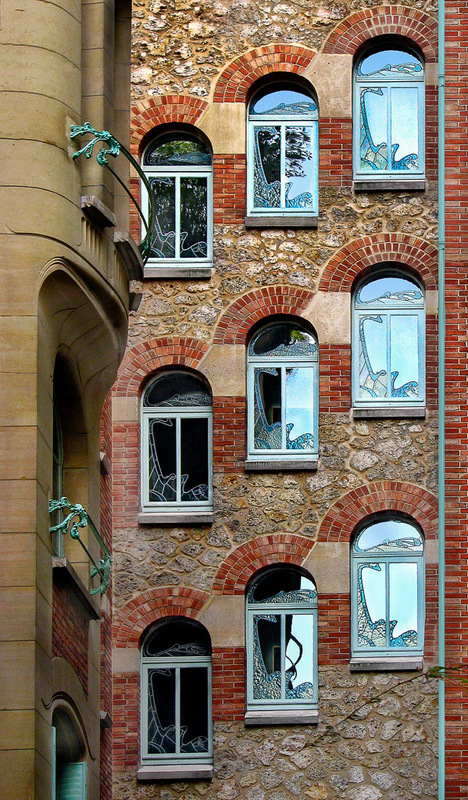 A building designed by the architect considered to be the father of Art Nouveau. 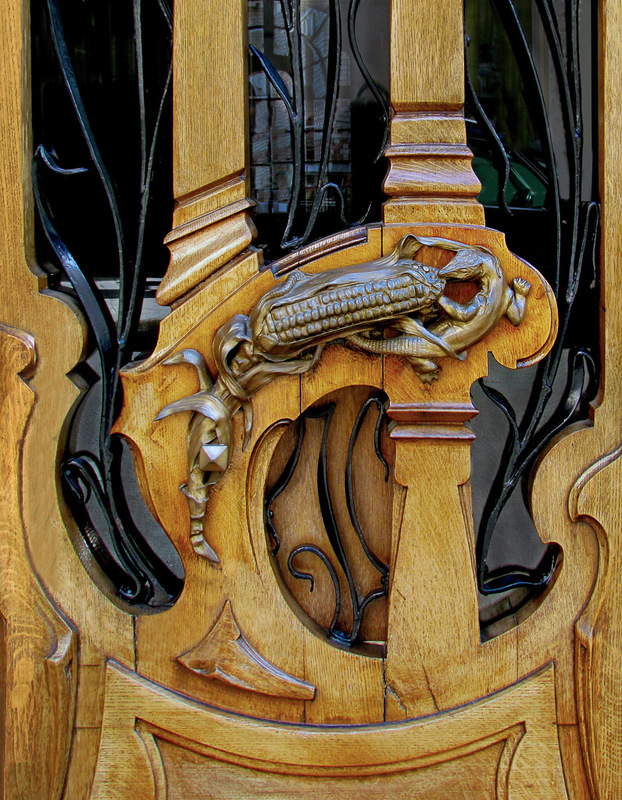 A detail of the door on the famous buiding in the 7th designed Jules Lavirotte. 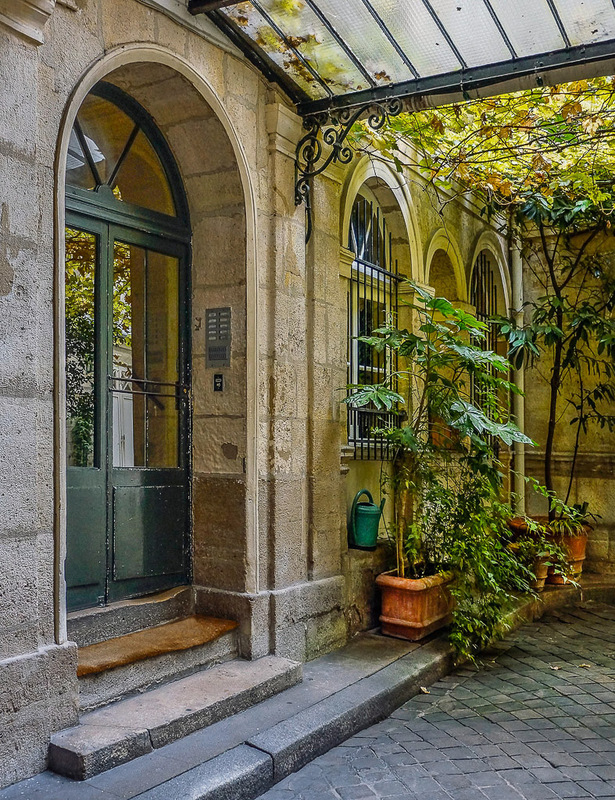 Apartment entrance on Île de la Cité just a block away from Notre Dame. A busy brasserie popular with the locals in the non-touristy Buttes aux Cailles. 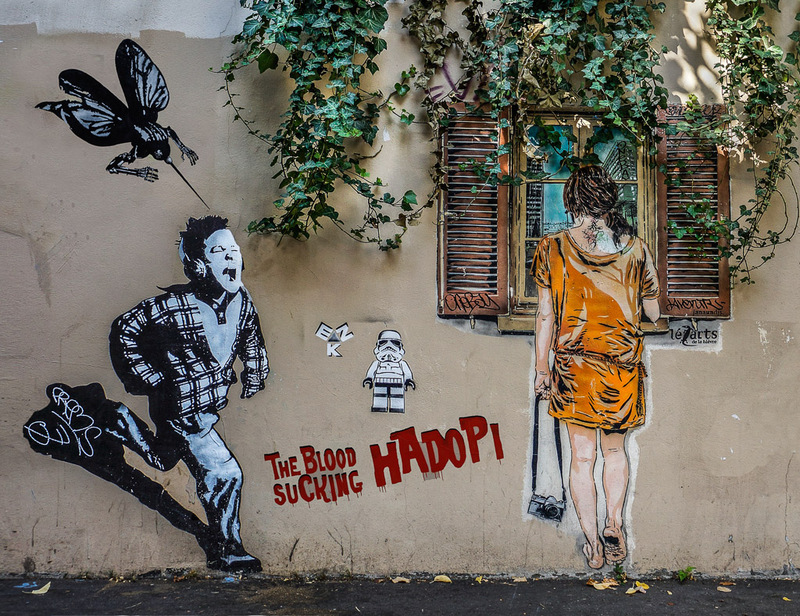 One of the many unusual works of grafitti found in the Buttes Aux Cailles. 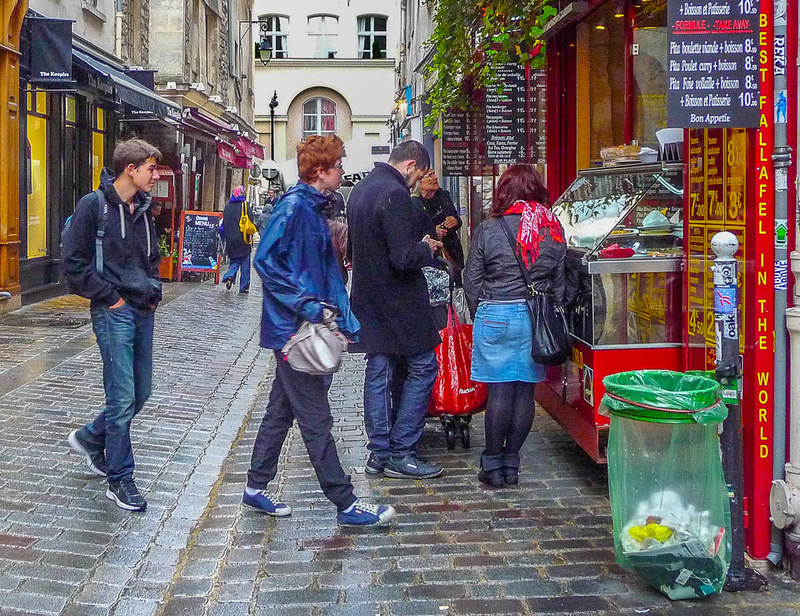 A very popular restaurant near the Place Des Vosges. 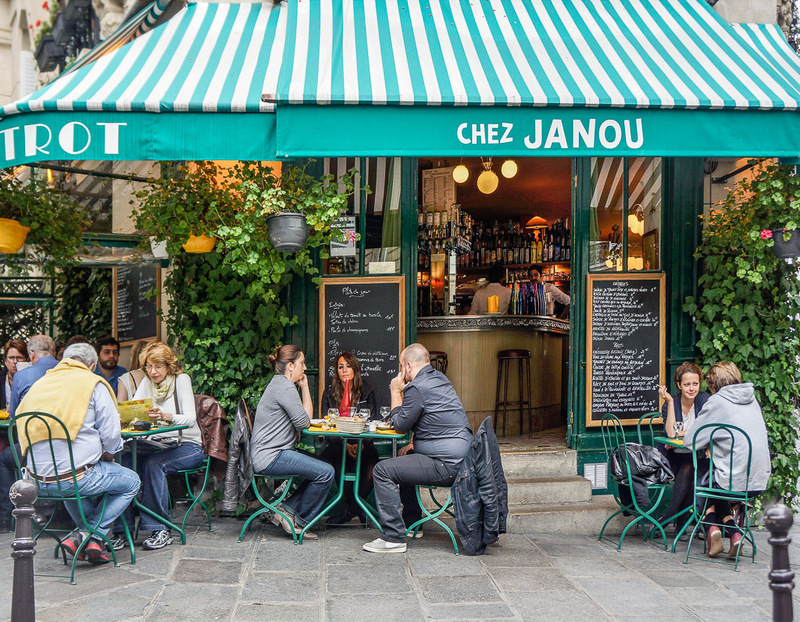 A favorite food in Paris is found in the Jewish Quarter of the Marais. 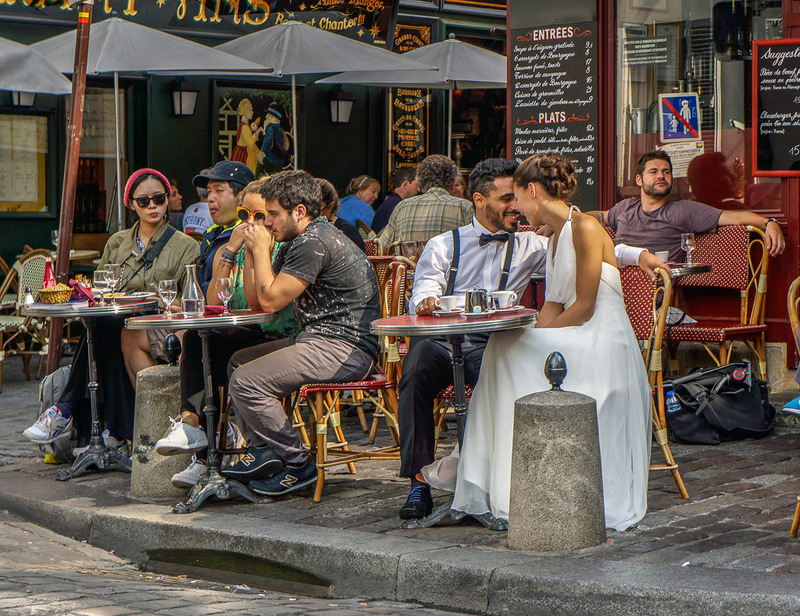 This couple celebrates their wedding at a Montmartre sidewalk cafe. 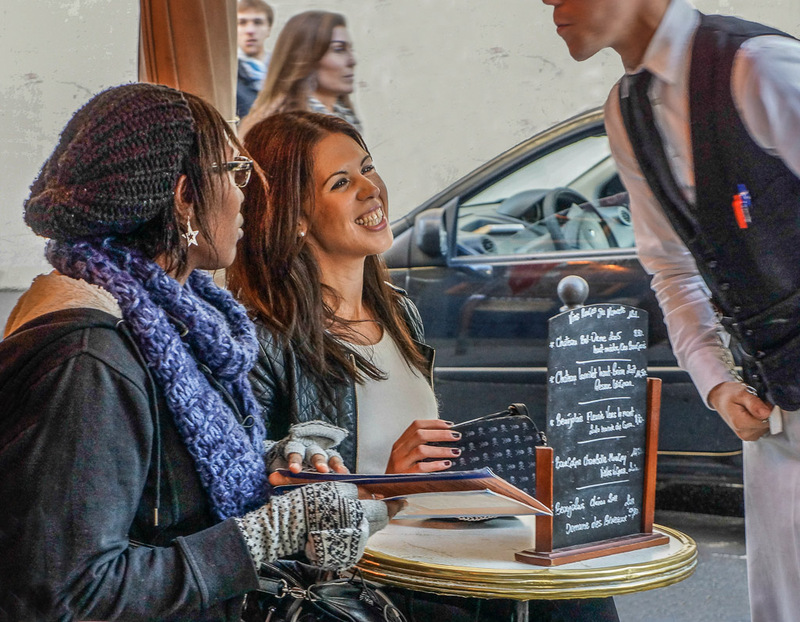 Ordering and flirting at a side walk café on Rue de Turenne. 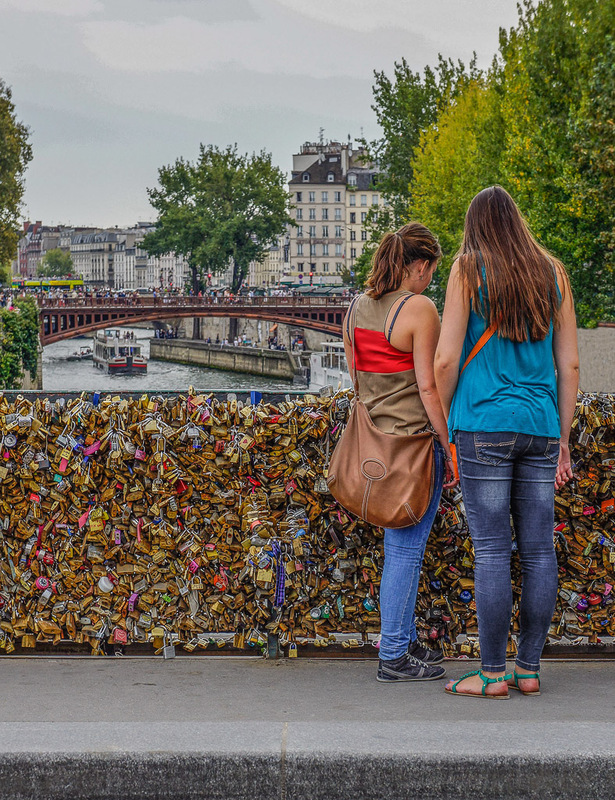 Any guesses as to what famous French couple these two resemble? 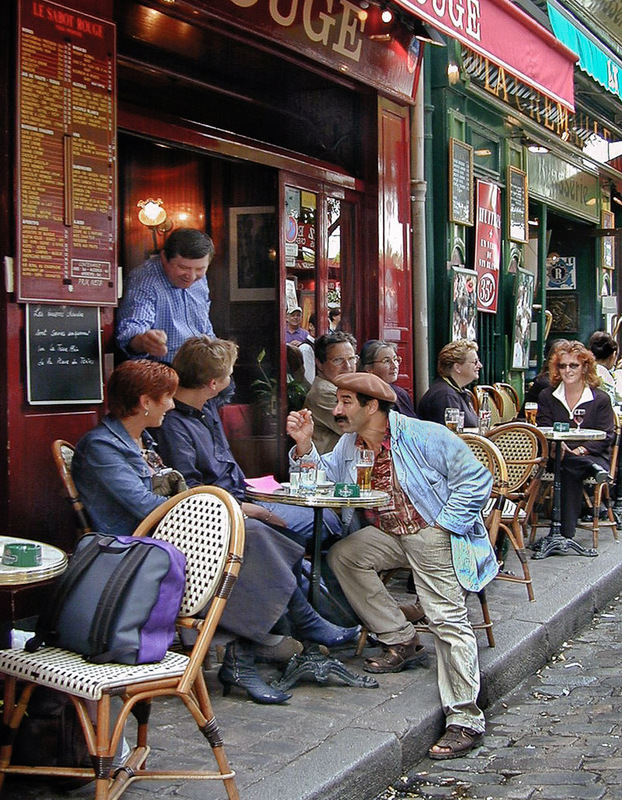 The Paris cafés and restaurants are where much of the Paris social life takes place. 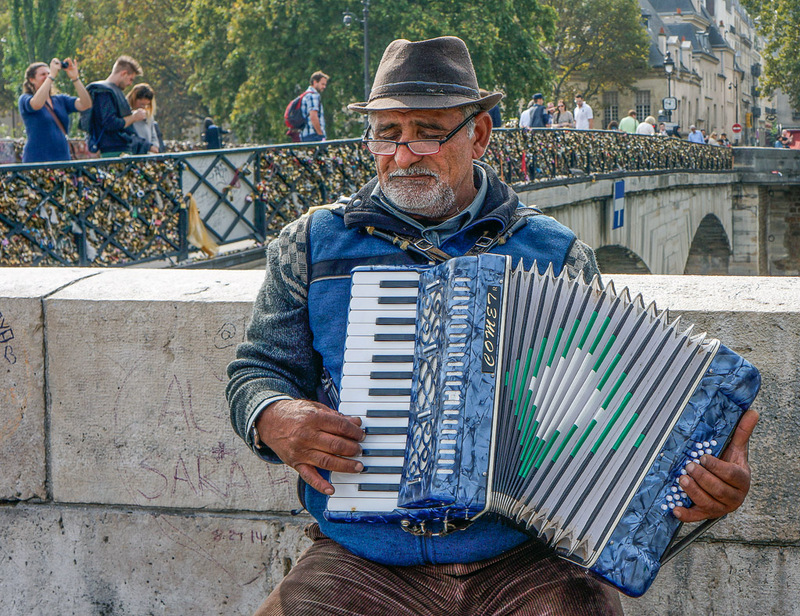 He's been making music for many years along Rue Des Francs Bourgeois. 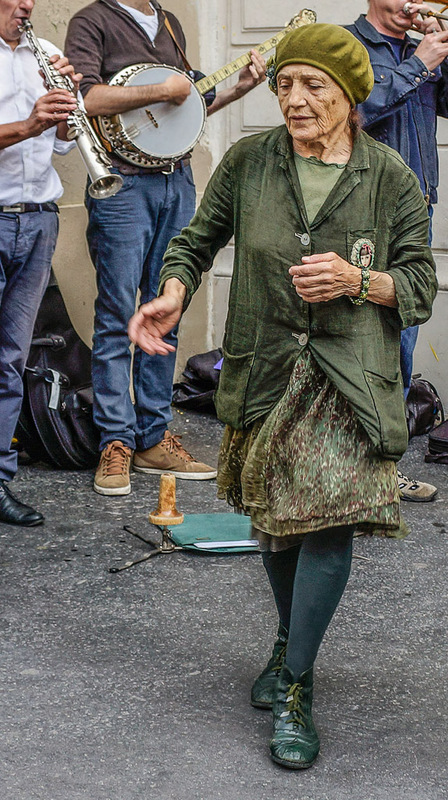 This senior street dancer attracts a big audience on Rue des Francs-Bourgeois. 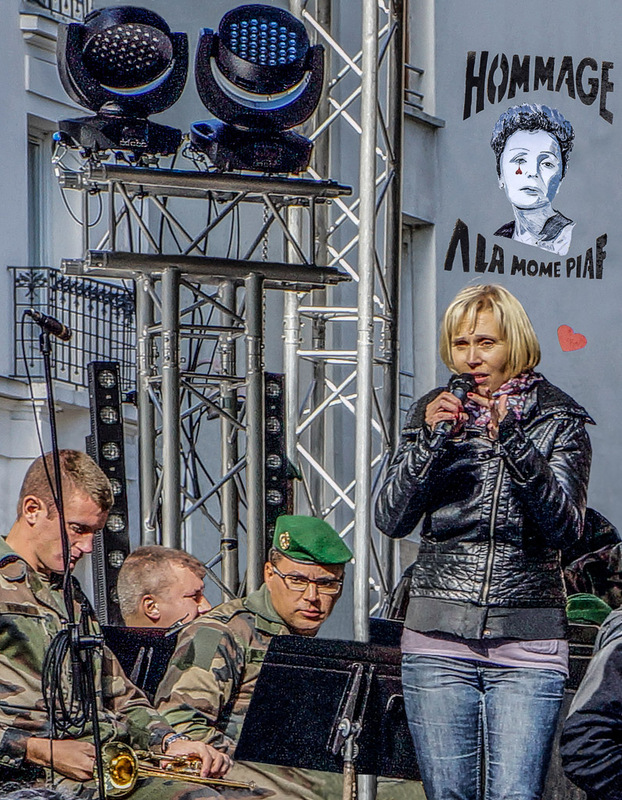 Nathalie Lermitte sings the songs of Piaf on the 50th anniversary of her death. 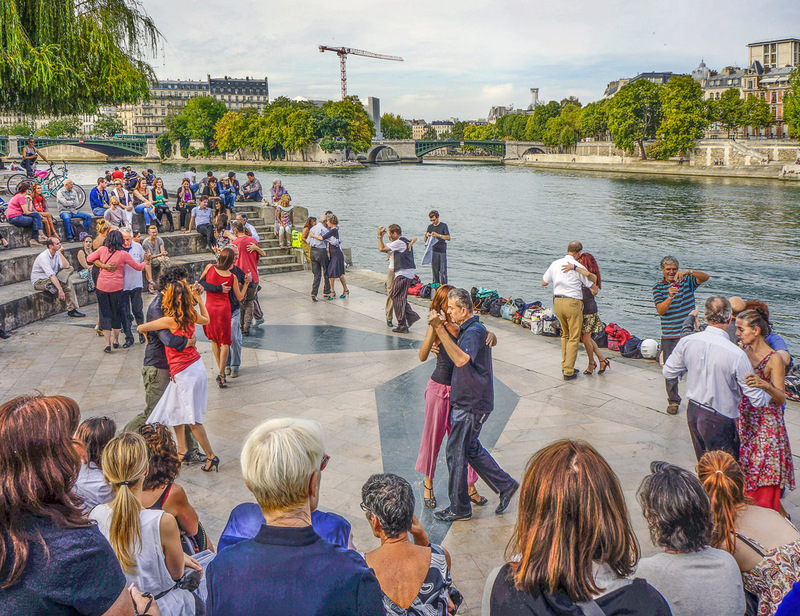 There a a number of spots along the Seine to Tango as well as free lessons. 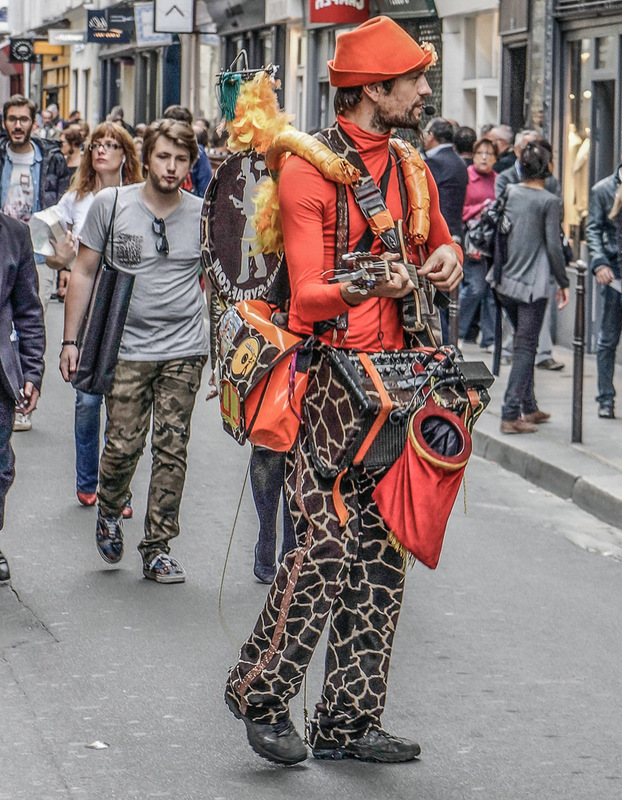 He's a regular on Pont. St. Louis connecting Ile St. Louis to Île de la Cité. 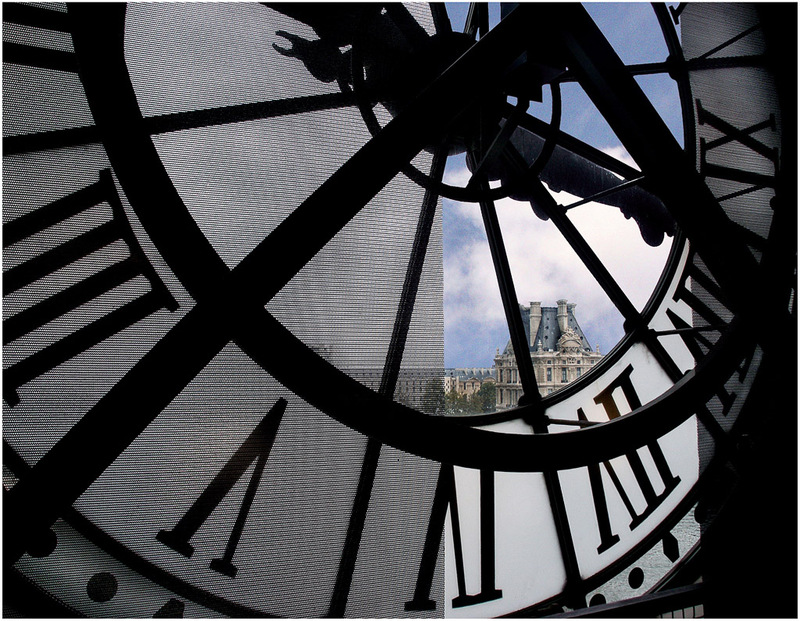 Paris 500 years ago seen through the big clock at the d`Orsay Museum. 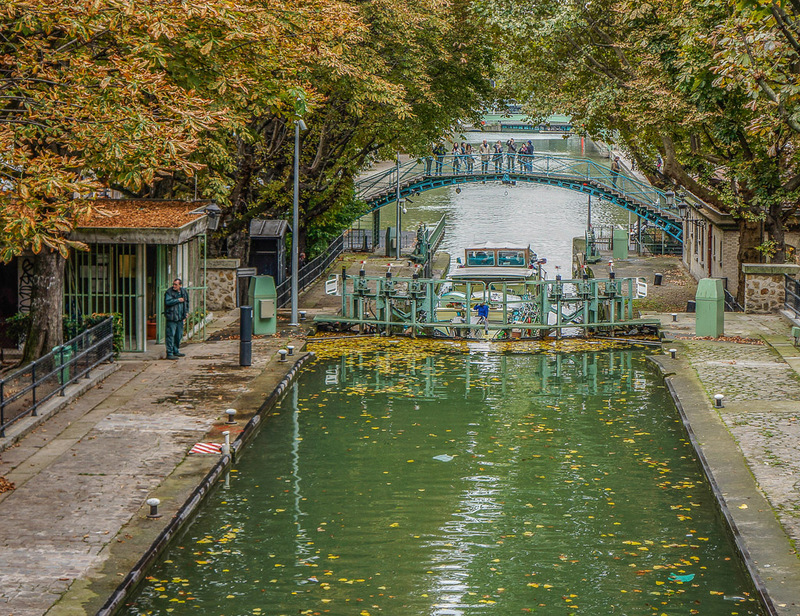 A visit to the canal makes for a great day's outing either by pied or by batteau. 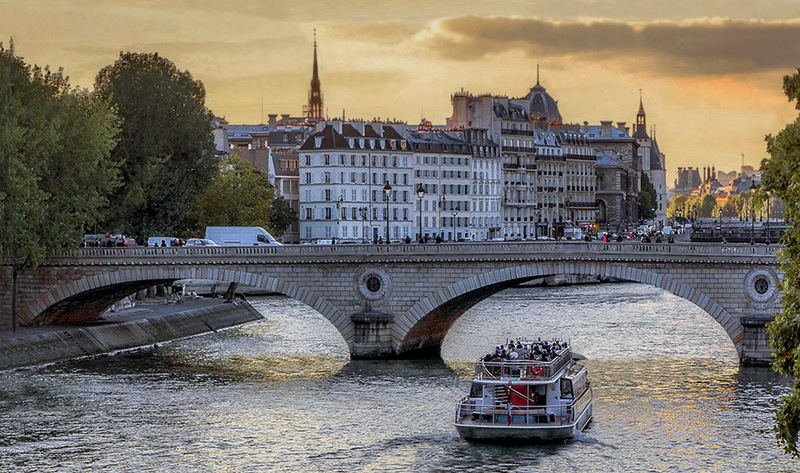 A sunset cruise along the Seine is a beautiful way to end the day. 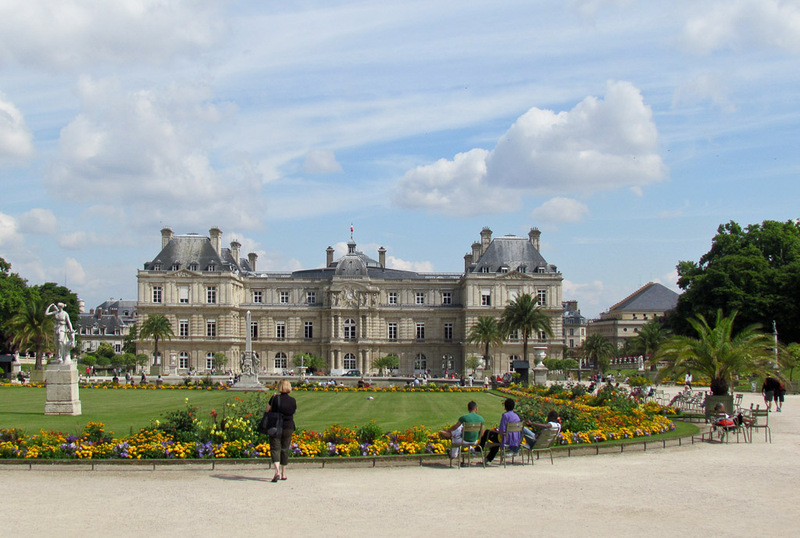 It's beautiful gardens and museum are a must visit on every visit to Paris. 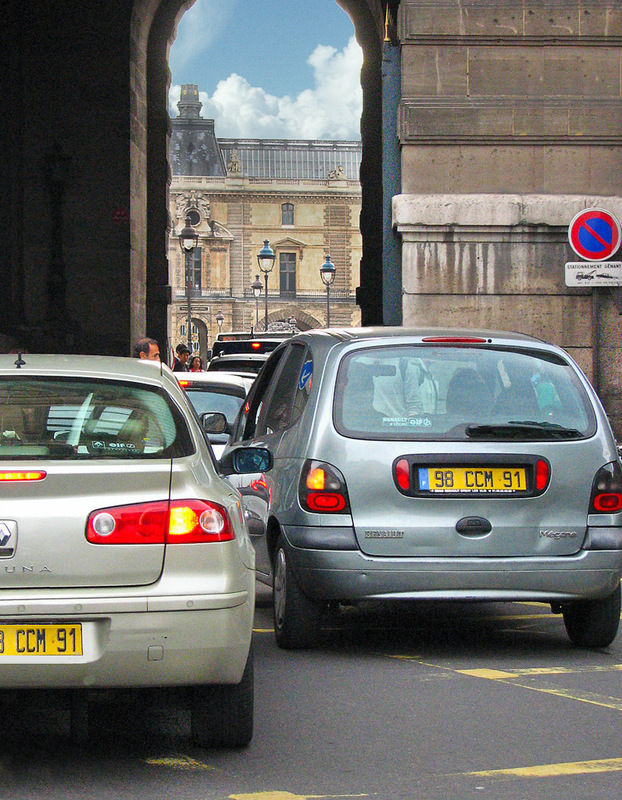 Traffic entering the Carousel du Louvre squeezes down to one lane. Tired travelers on the early morning train from the airport into the city. 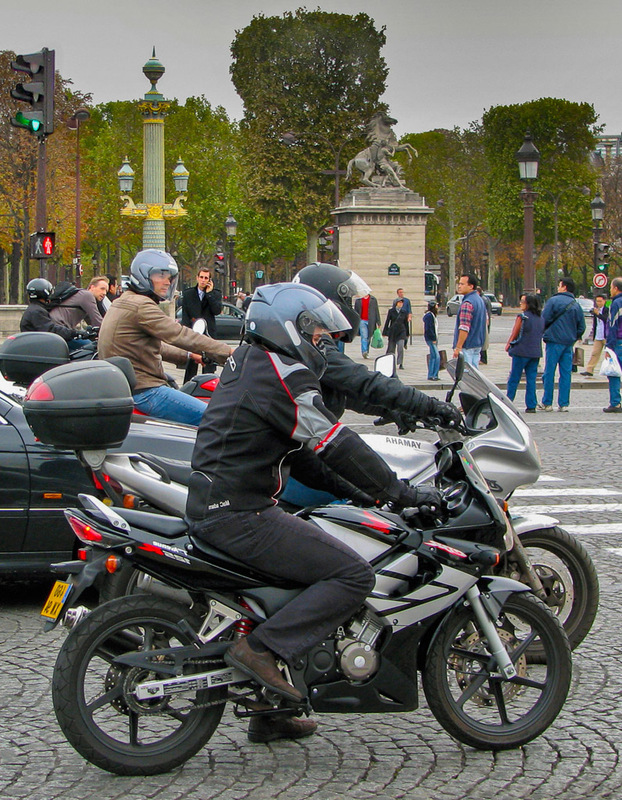 You'll see more cycles with riders of both sexes in Paris than in New York City. 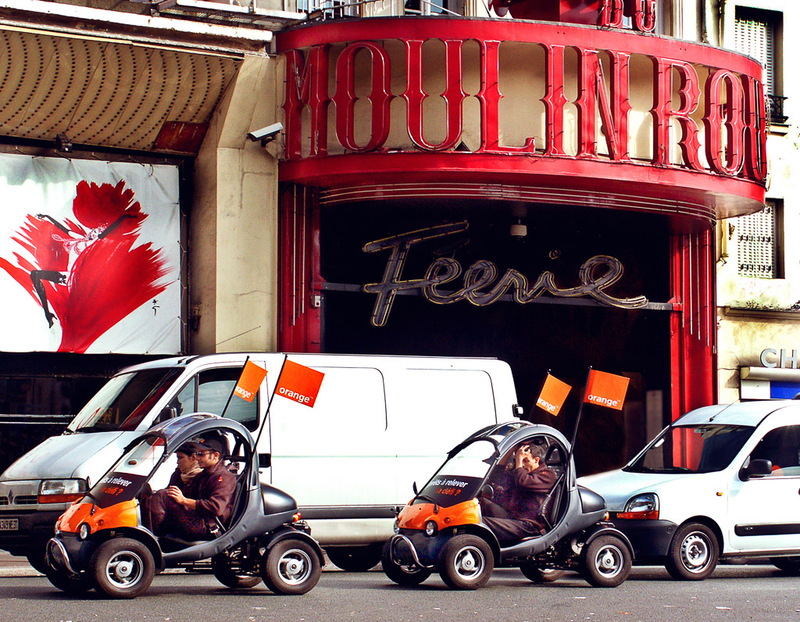 High gas prices inspire the design of cars like these driving past the Moulin Rouge. 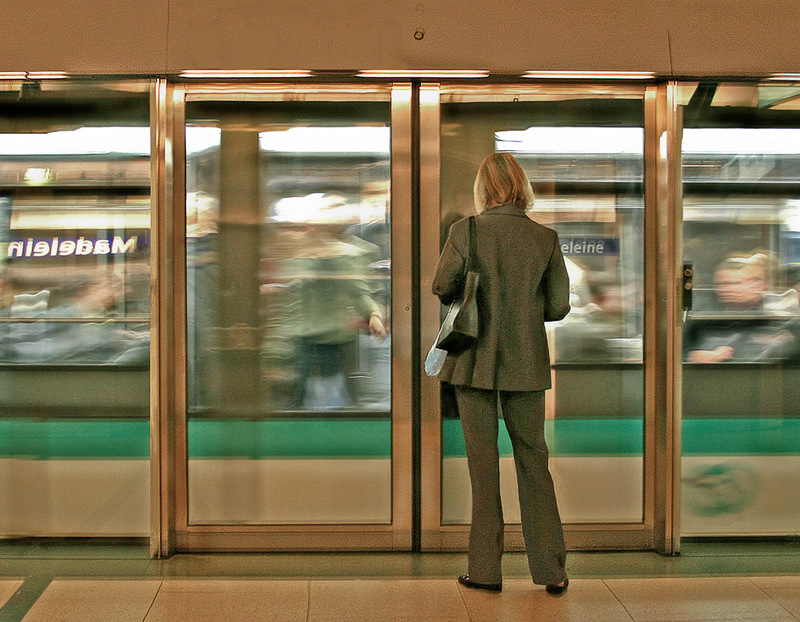 A fully automated train in the Metro System that travels at speeds up to 25 mph. 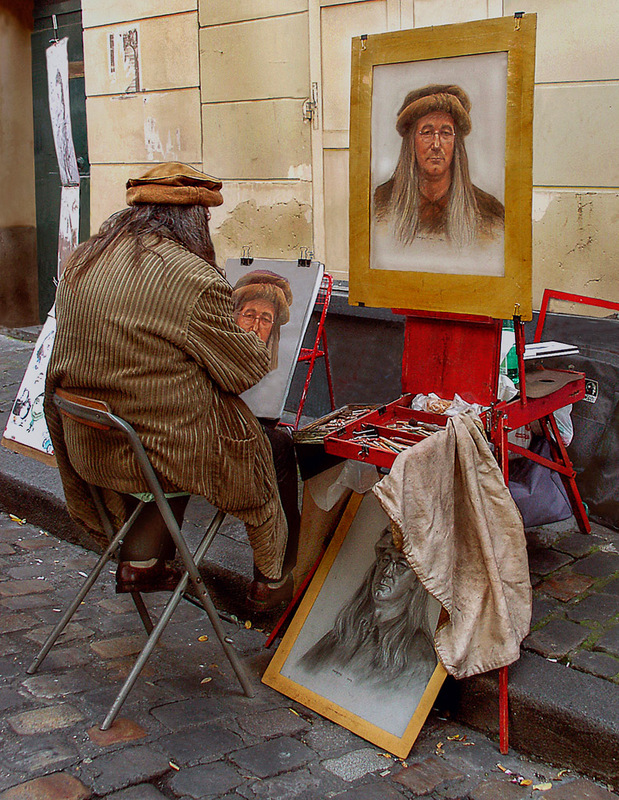 A self portrait artist hopes to sell his work at Place Tertre in Montmartre. 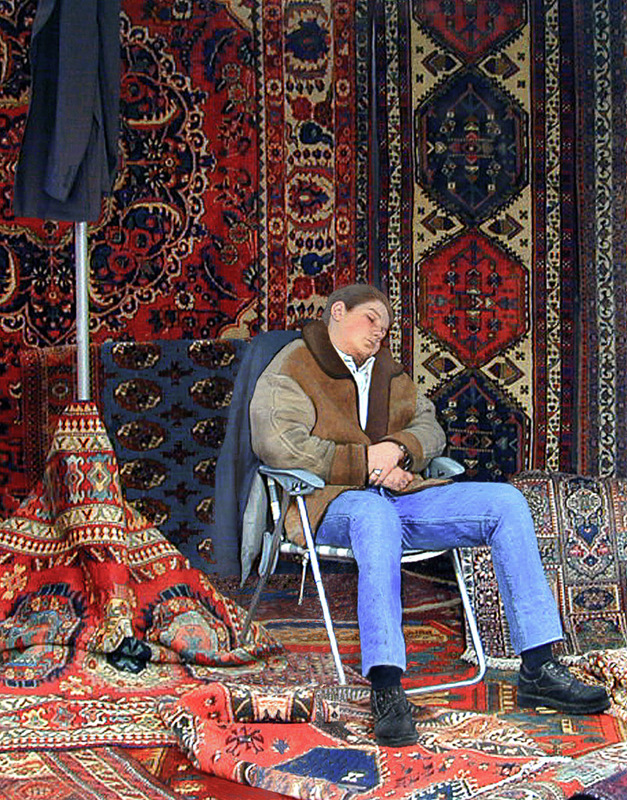 The rug merchant's assistant at the antique market . 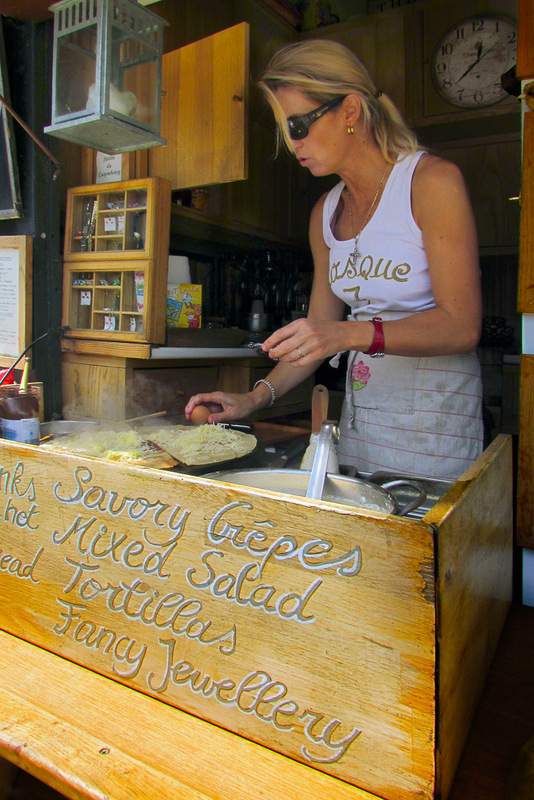 Delicious crepes for lunch today in the Jardin Luxembourg. 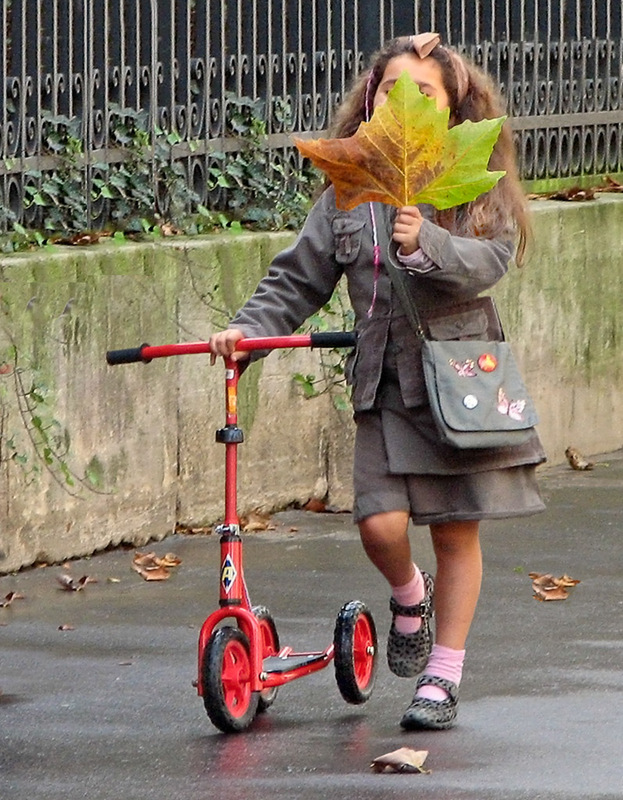 Hopefully she can still see where she is going while she is smelling the leaf. 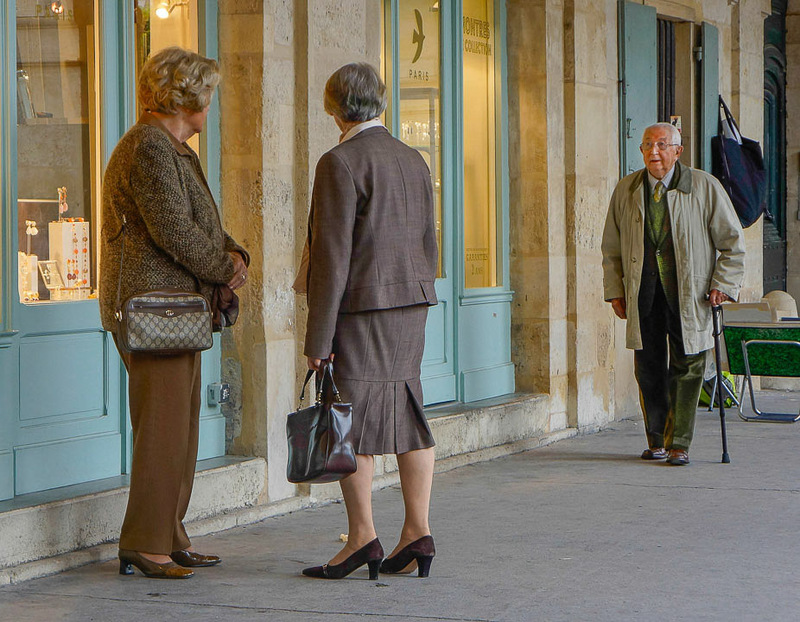 Every so often they stop to let him catch up as they stroll of the shops at Place Des Voges. 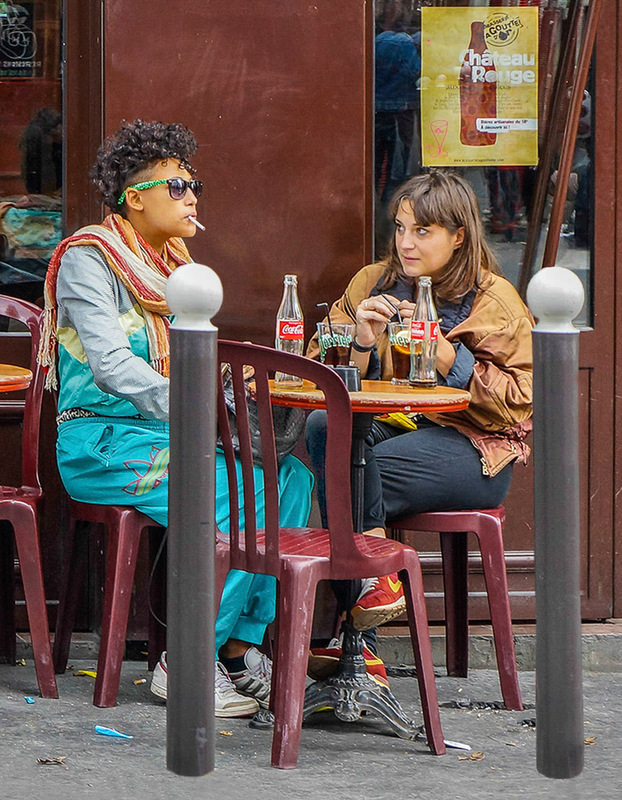 Friends unexpectly meet at the Montmartre Fete de Vindage. Participants in the grand show put on in hopes of being chosen as the site of the 2008 Olympics. 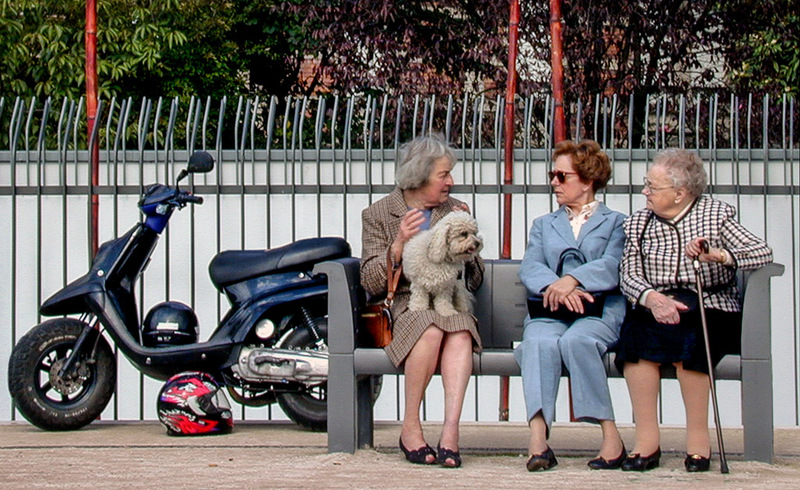 Who Came on the Scooter? 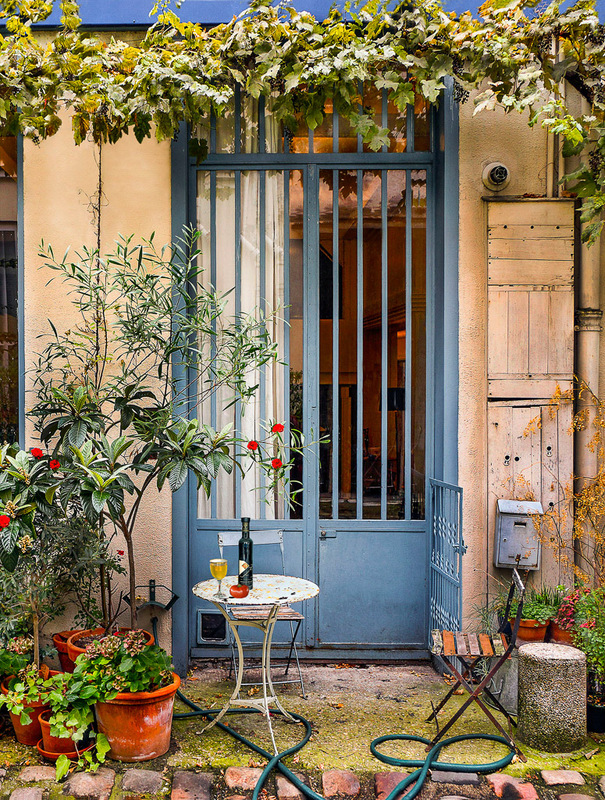 The many public benches in Paris make perfect places to visit with old friends. 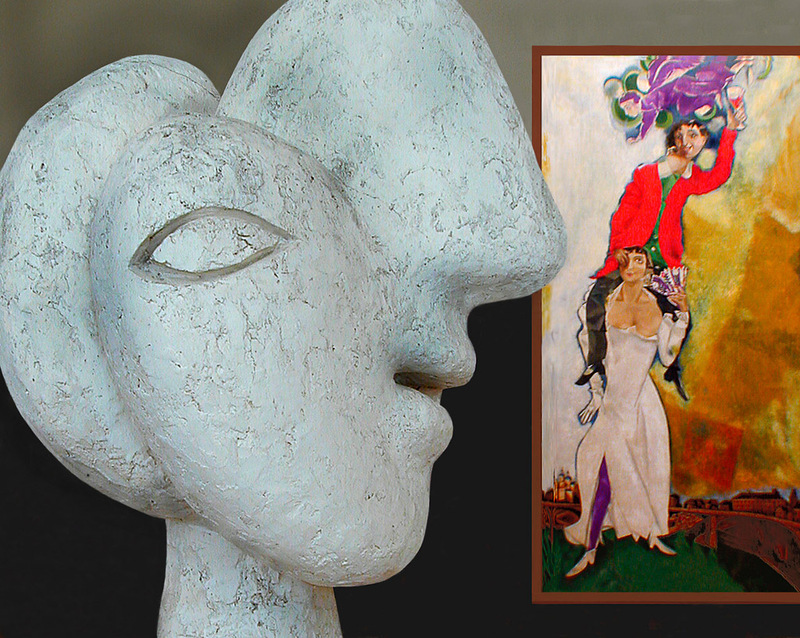 The Picasso sculpture seems to be gazing at the Chagall painting. 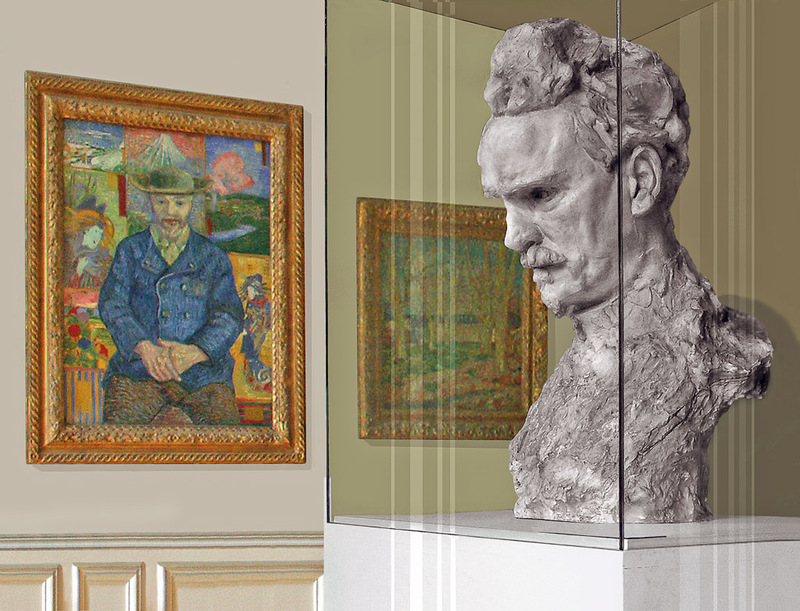 Many museums are dedicated to specific artists such as Rodin, Picasso and Monet. 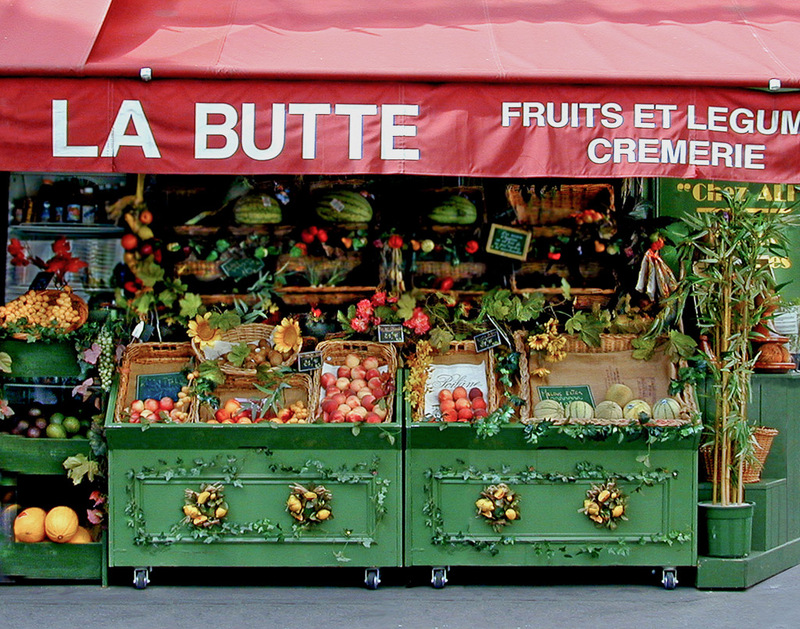 This colorful fruiterie was featured in the popular French movie "Amalie". 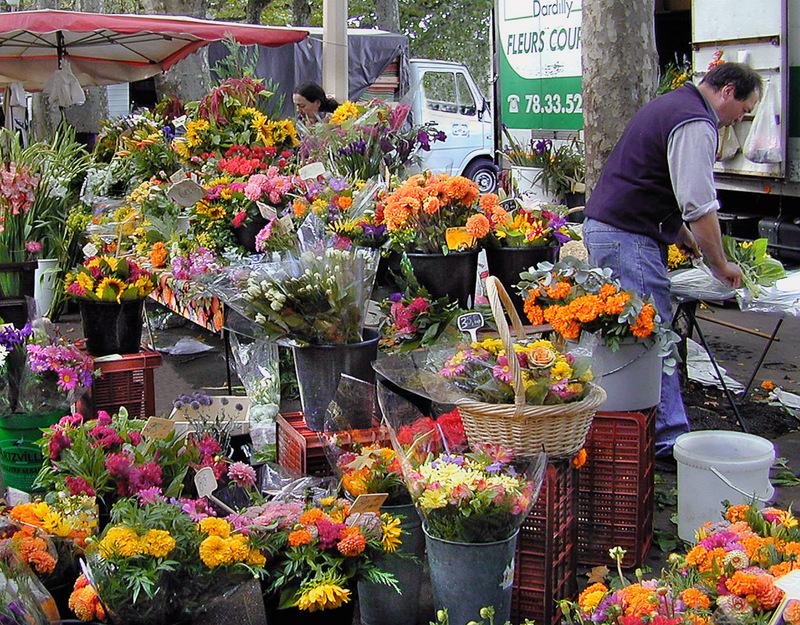 The French love flowers in their lives, clearly evident by their many flower markets and florists. 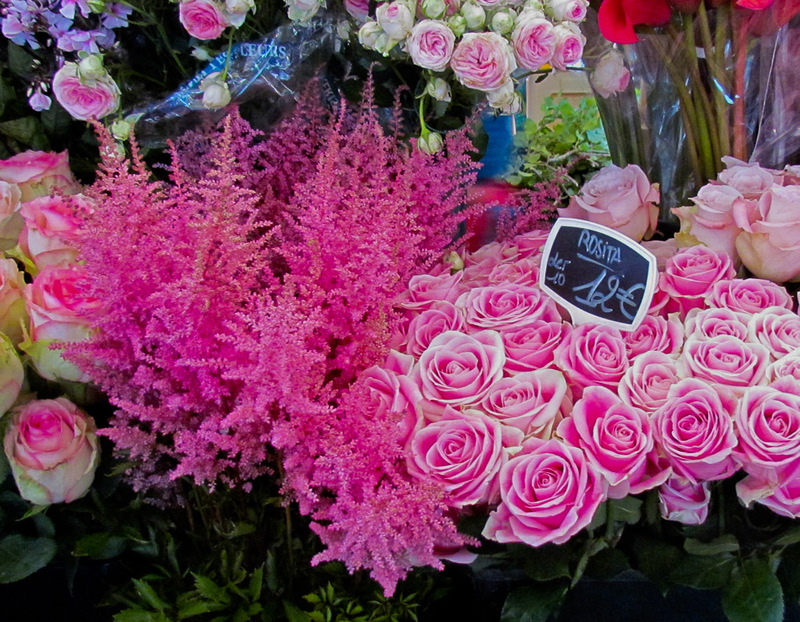 Some of the beautiful flowers that can be found at the Marché de l'Alma. 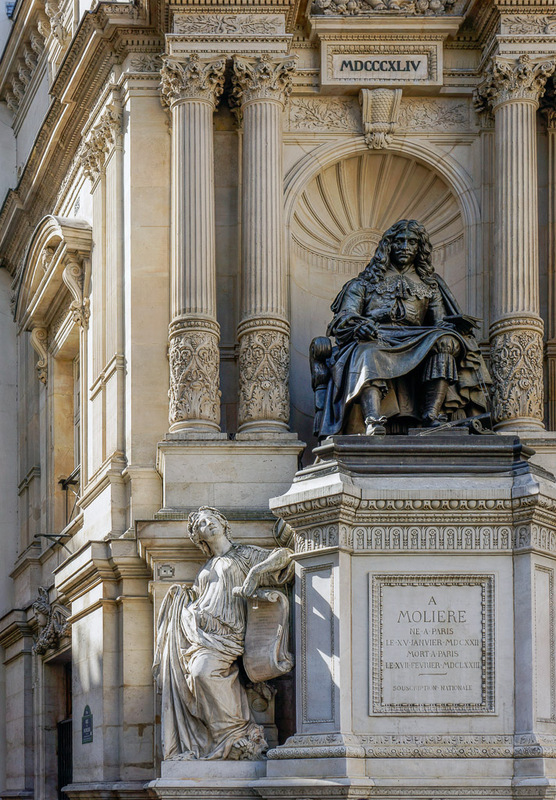 The statue is at Fontaine Molière at the junction of rue Molière and rue de Richelieu. 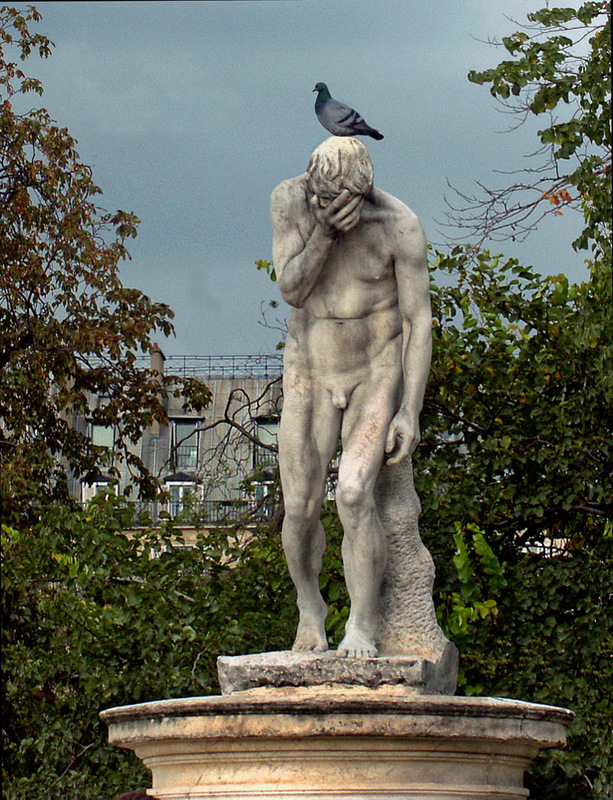 Much fine sculpture is found in the city's many well tended parks and gardens. 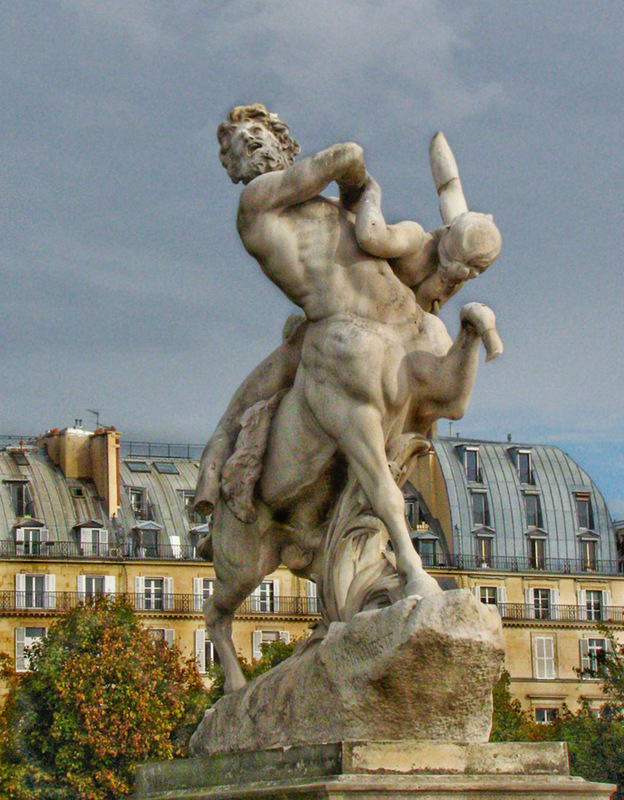 This sculpture is found in the Jardin des Tuileries near Rue Rivoli. 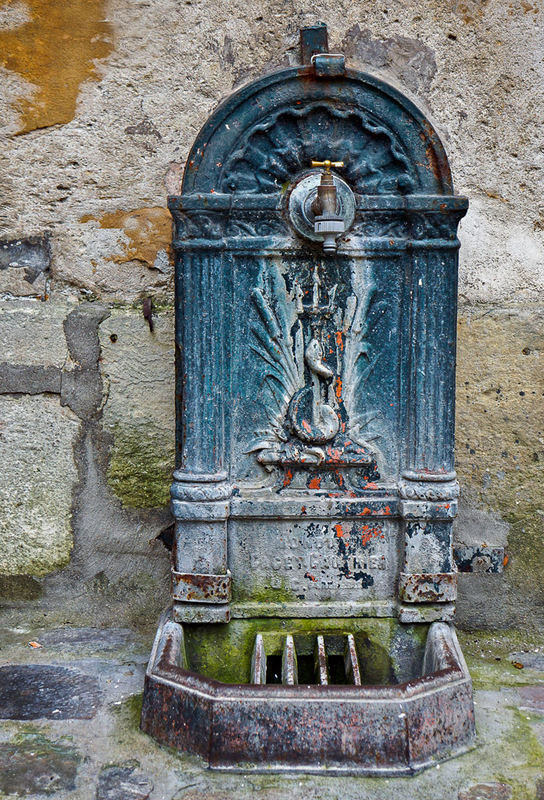 An old fountain in an apartment courtyard at the Place Des Vosges. 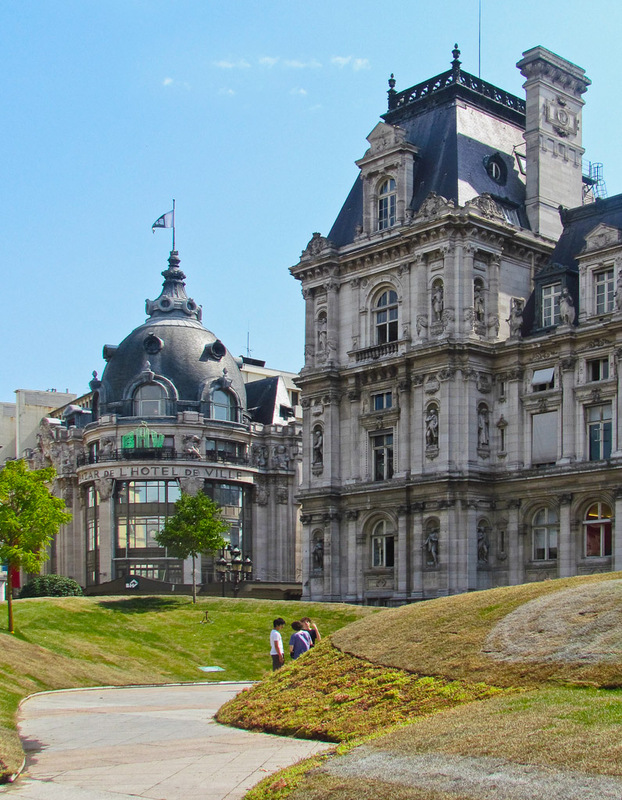 A great place where Parisians can see wonderful art and photo exhibits for free. 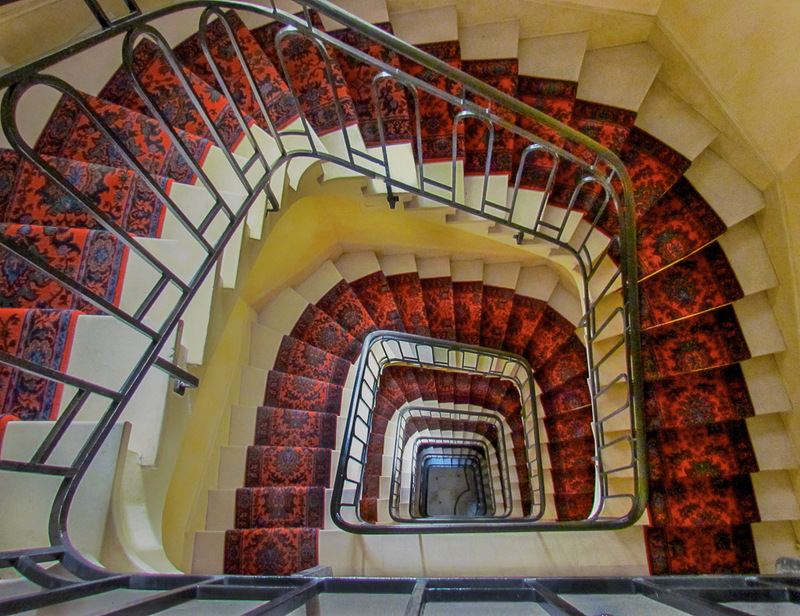 A staircase design typical of those found in many Paris apartment buildings. 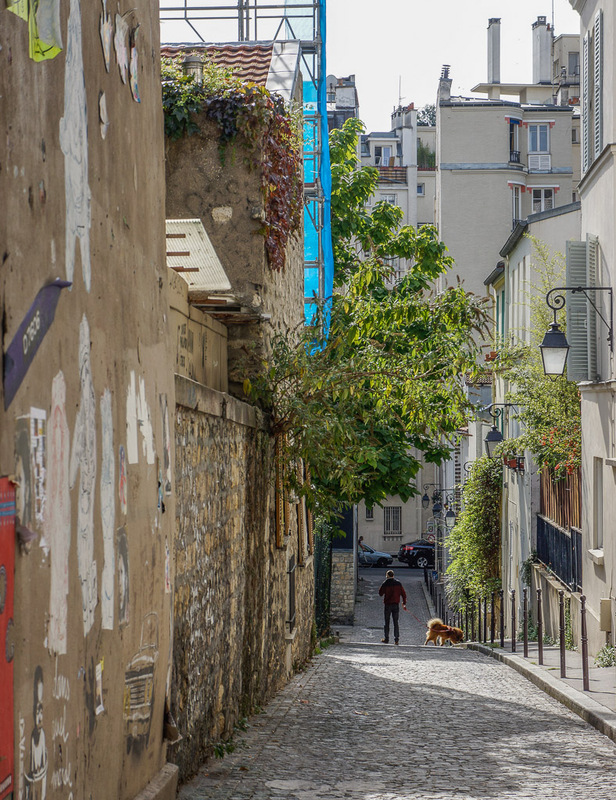 Walking the dog down a street in the Buttes Aux Cailles. 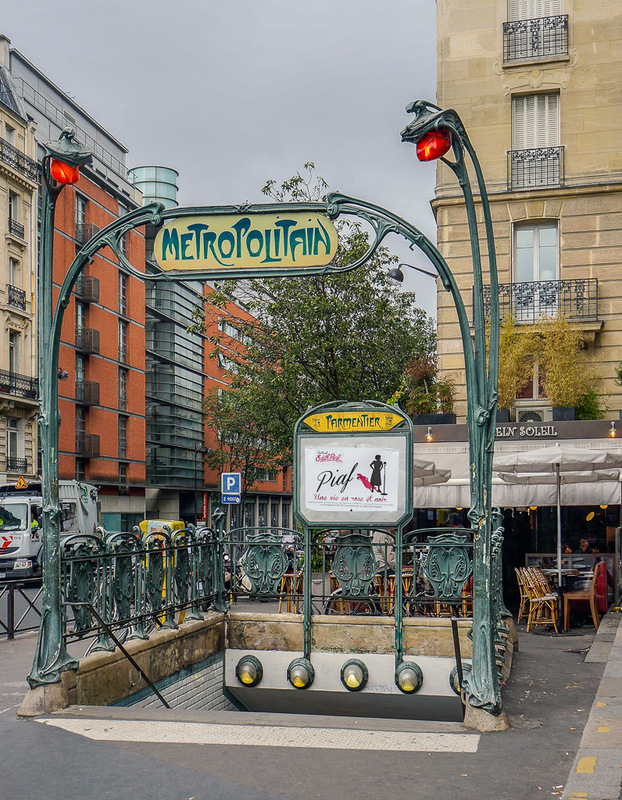 The famous art nouveau Metro sign designed by Hector Guimard. 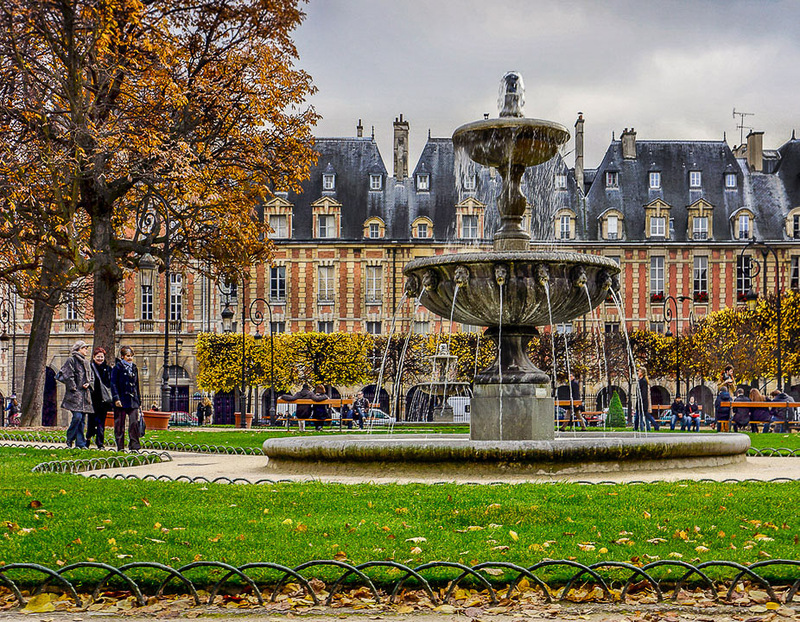 Shops, art, restaurants, and luxurious apartments surround a beautiful park and it's fountains. 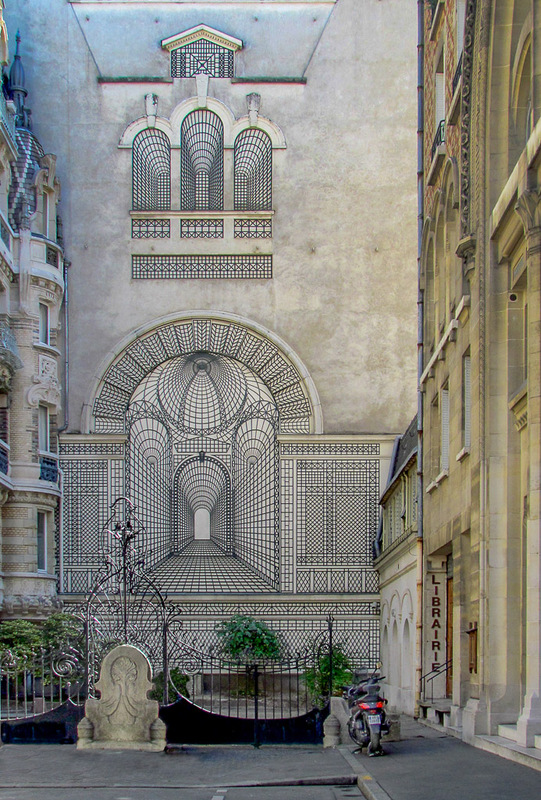 There are many such residences in the alley ways off of Rue Oberkampf. 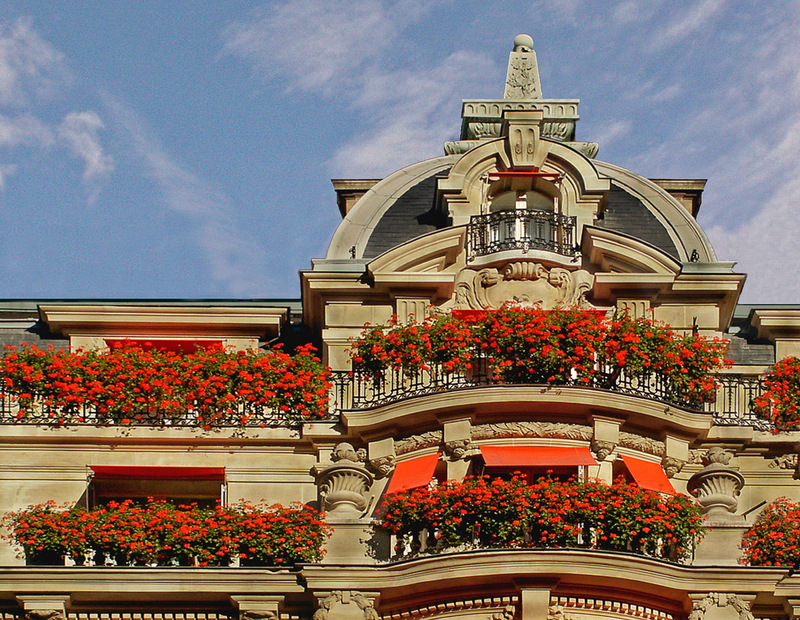 Fashionable Paris windows and terraces are adorned with brightly colored flowers. 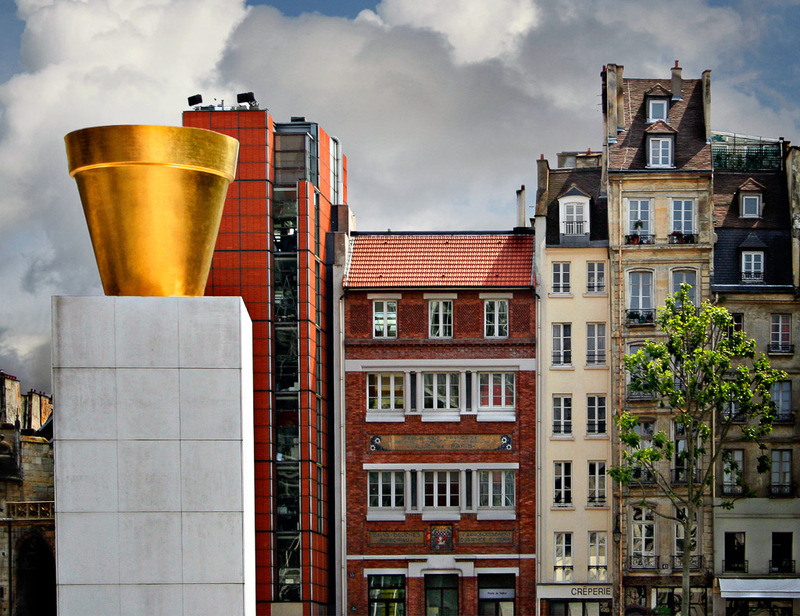 This golden pot was part of a sculpture display by the Pompidou Museum. 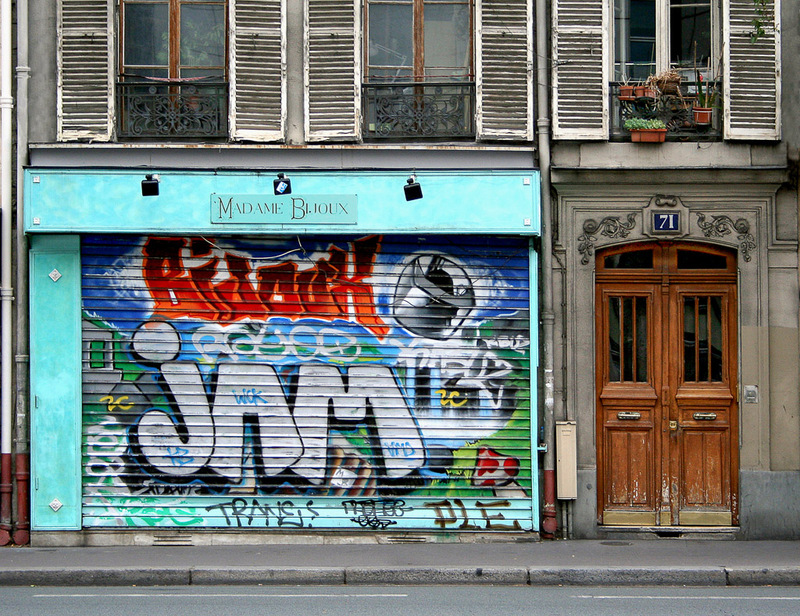 Grafitti artists are doing their work in Paris just like in every other major city. 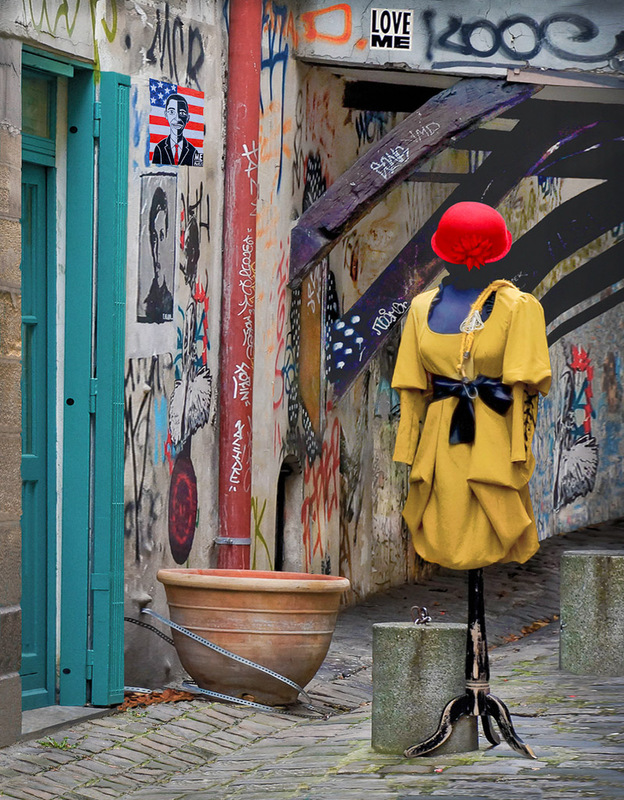 You'll find lots of interesting French fashion in the alley ways of the Marais. 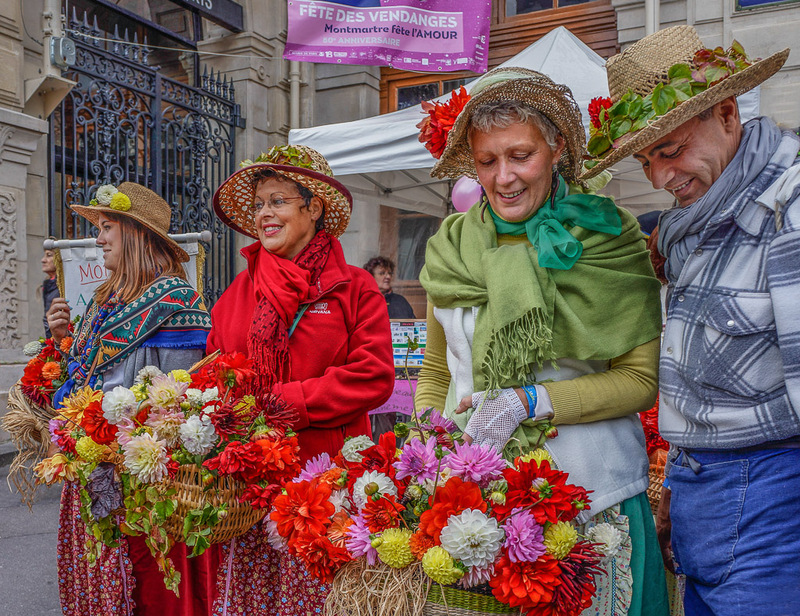 Colorful costumes worn by participants in Montmarte's annual wine estival. 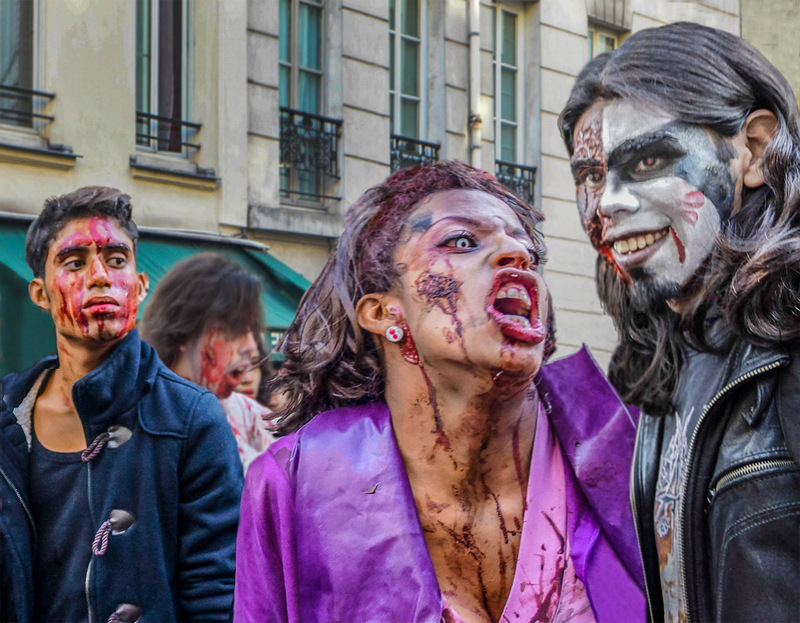 Honored guests in Montmartre's Fete de Vindage parade. 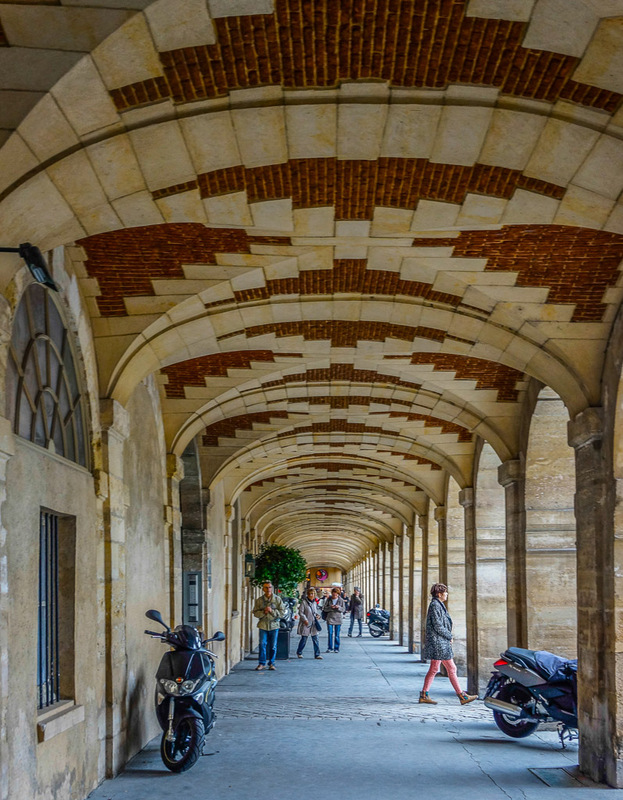 Paraders in the annual event as they pass through Place Des Vosges. 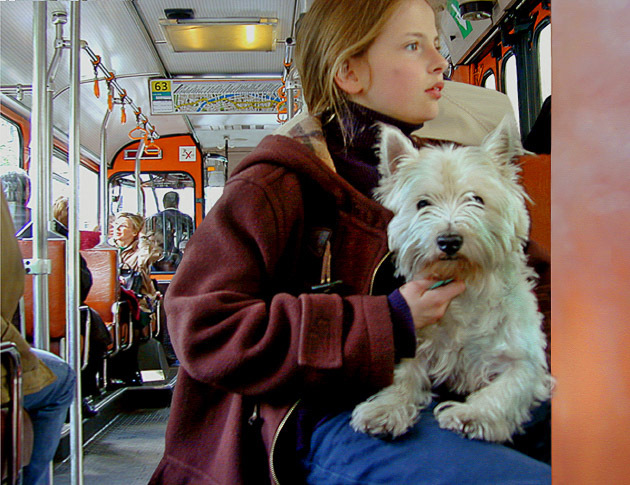 You will see many dogs riding the buses, trains and Metro in Paris. 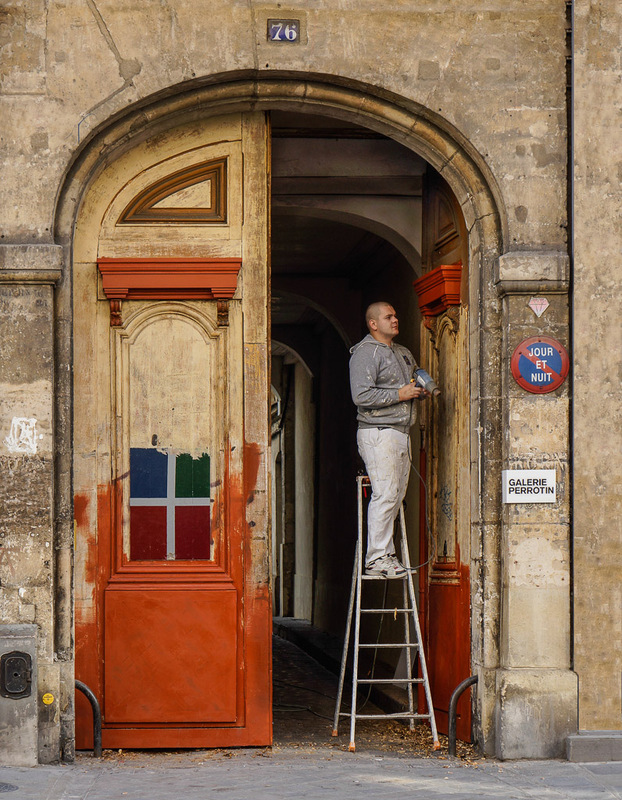 A bright new coat of paint brings new life to a very old door. She seems to be giving him a slightly incredulous look?